Updates are now at the top of the page for easier access...This is seriously outdated! The Stucco is finally finished and it looks good. They finished the back of the house today and took down all the plastic covering the windows and doors, so it seems incredibly bright inside now! You may have noticed that the plastic was off the windows in the previous pictures, but that is just because of my lag time in taking the pictures. 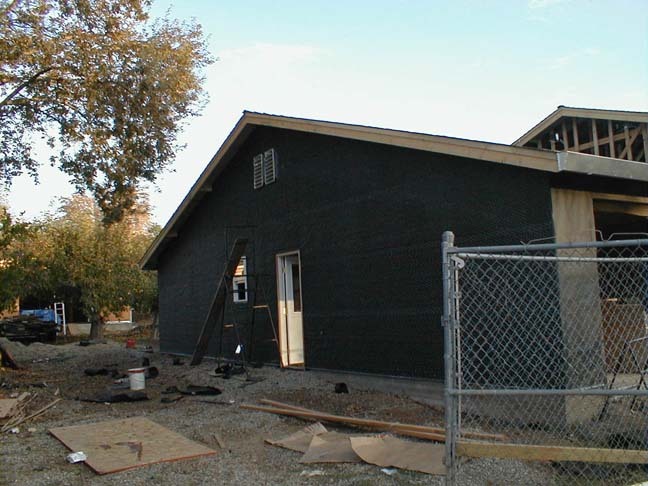 I don't have any pictures of the back of the house to post because the stucco hasn't finished curing yet, so it looks dark and splotchy. 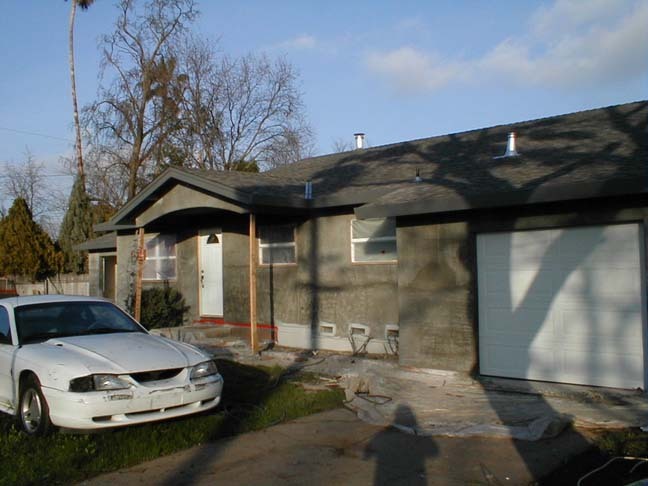 This is a shot of the front of the house and from another angle. Dave got the doors and hardware put back up today, although I showed you pictures of them earlier (once again attributed to my lag time). The carpet was installed today. 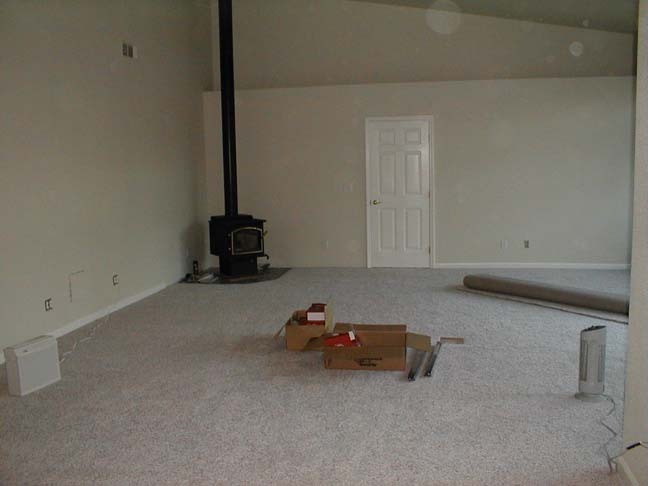 The installers brought the wrong carpet out for the family room, but after Sandra made a quick trip to the carpet store to confirm the correct carpet, we were back on track. 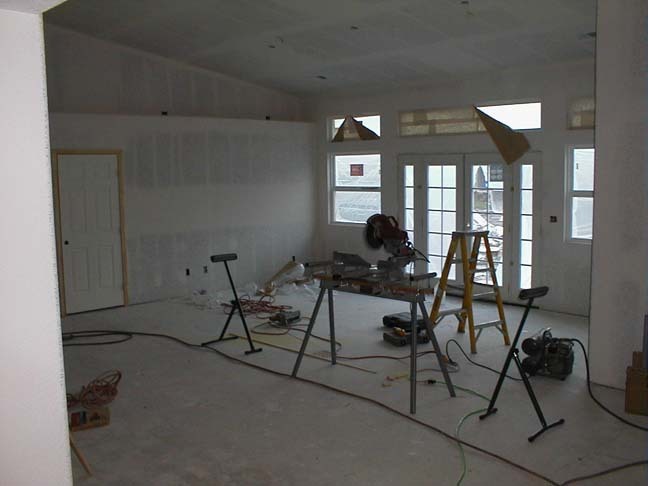 Here is a shot of the the Family Room looking towards the connection to the old portion of the house. 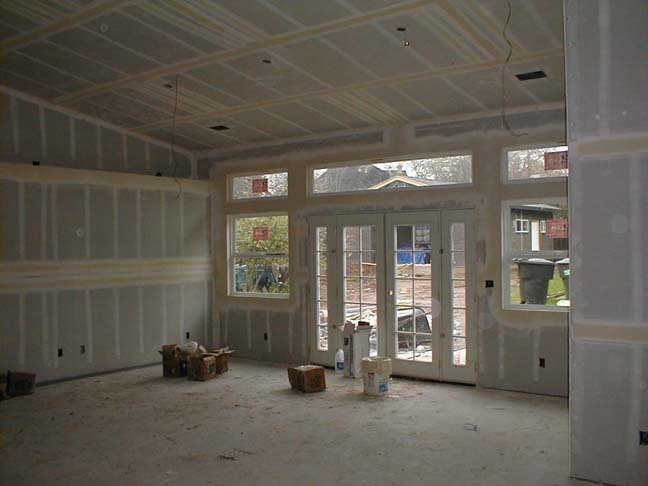 Here is another shot of the Family Room looking towards the hallway going towards the bedrooms, notice that the door and hardware are installed! 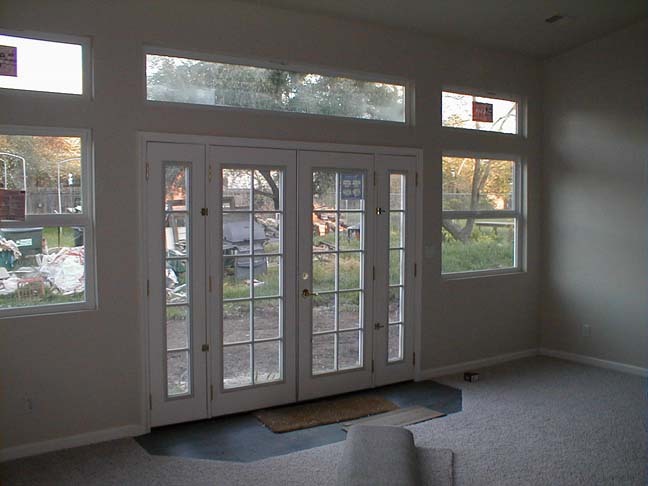 Here is another shot of the Family Room looking out the back doors. Yes, I realize the yard is a mess, but it is still considered a construction site, so I have an excuse! 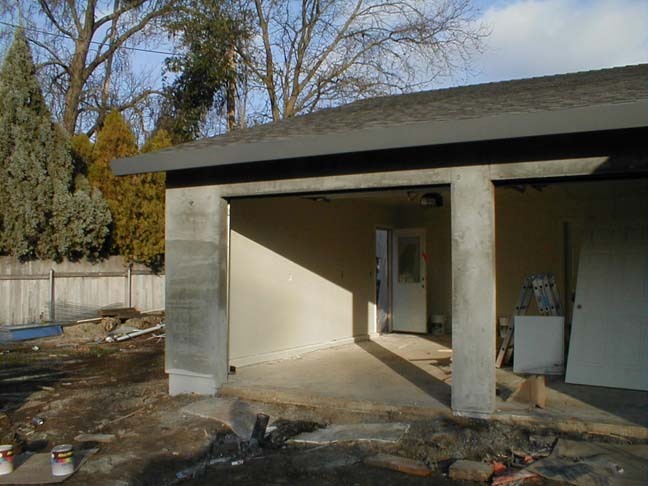 Unfortunately I got busy and didn't get a chance to take any pictures of the progress, but today the stucco guys were back and got the side and the front of the new garage completed. They will be working across the front of the house in the next few days. 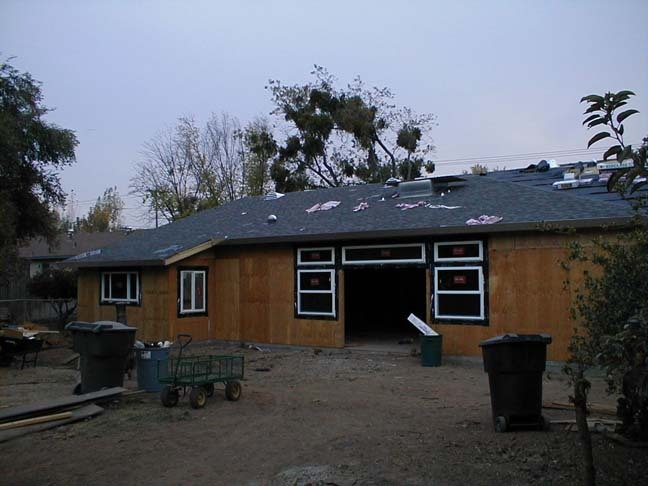 The completion of the stucco is a huge deal for us for a few reasons, #1 the house will look almost complete, #2 and more importantly, the plastic will be removed from the windows and we will be able to see out! 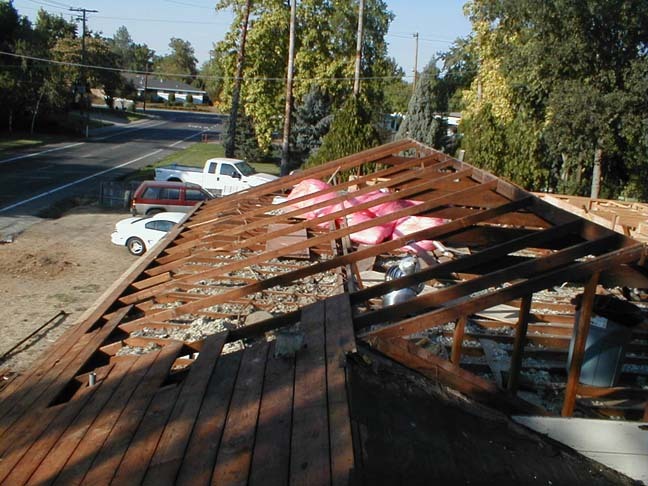 Something I forgot to mention on 3/6/03 is that the insulation was blown into the attic of the house and shop. We didn't know it had happened until I went to run some wires up there and discovered the change, they just didn't leave any evidence of having been there. 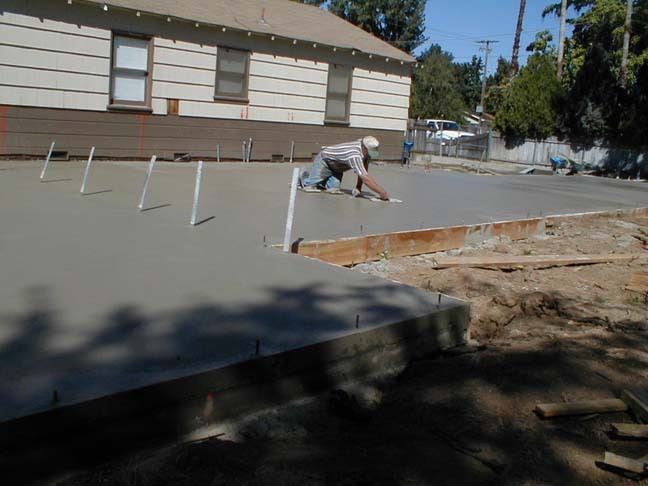 Mike, the concrete guy stopped by and took a look at what stage we are at, he will come back to do the concrete work after the stucco guys finish up. The stucco guys did show up today and set up some scaffolding, so they should start the color coat Friday! The plumbers came today and got the other sink in the master bath, they also had to jackhammer a portion of the slab to fit the bathtub in the master bath. 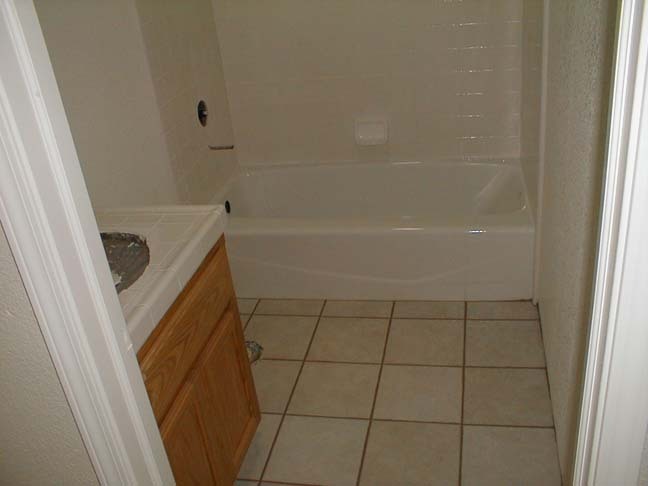 Here is another shot of the tub with the shower in the background. 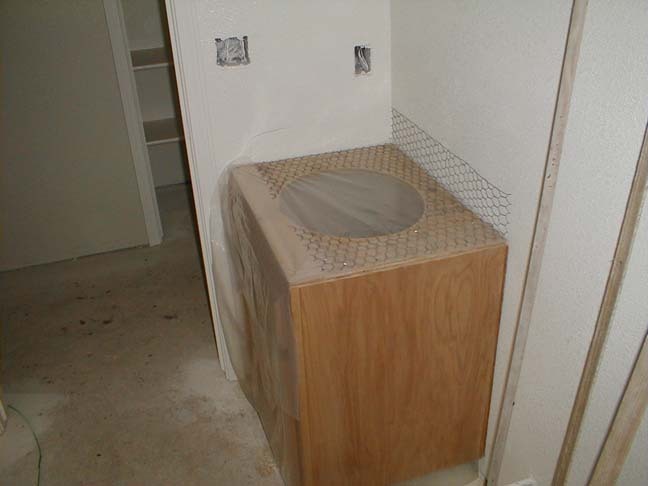 The shop toilet, sink and water heater were installed also. The electricians were here today and they got almost all of the electrical finished. 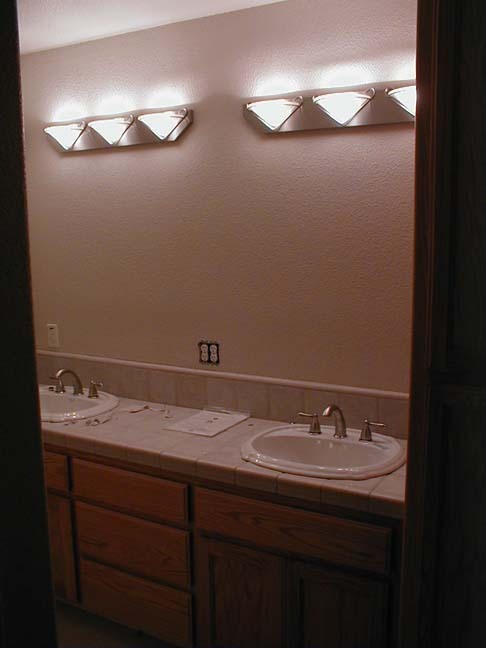 They installed all the switches and outlets in the house and shop, they also got all the light fixtures in the house. Here is the Family Room, the Hallway, notice that the solatube is just before the first light and is just as bright as the lights! 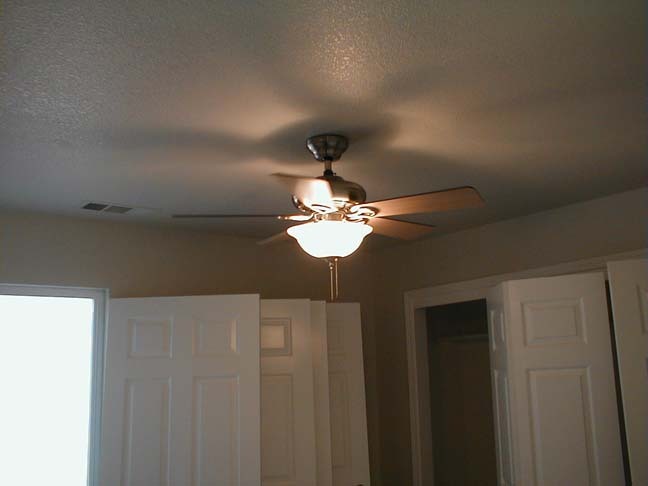 The fan and lights were installed in the Guest Bedroom, the Craft room has a matching Fan/light combo. 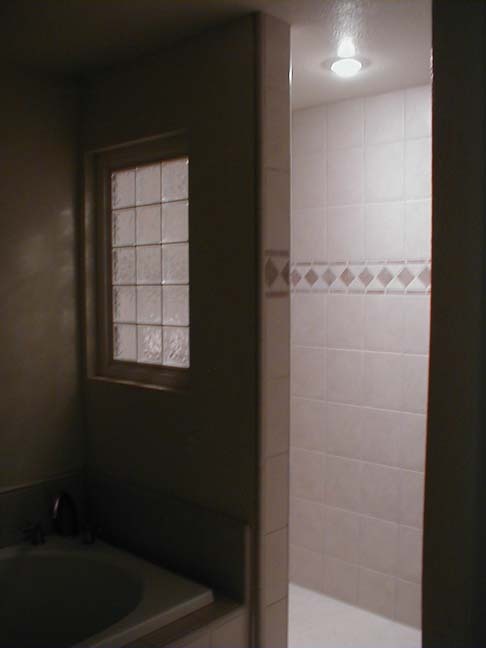 The lights in the Master Bath, and Shower were also put in. 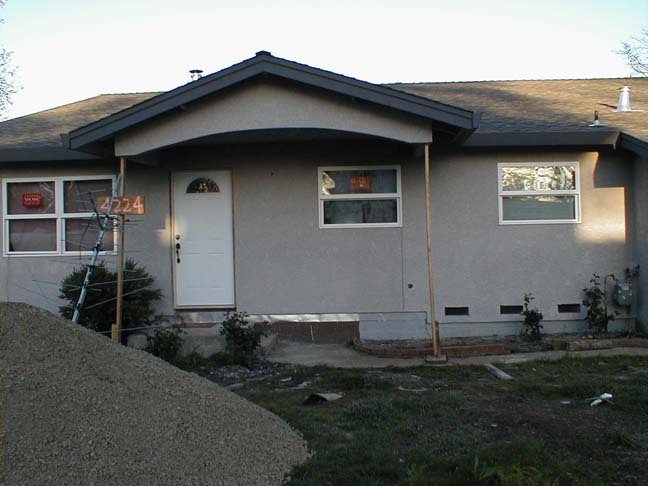 After the stucco is finished, they will come back and install the exterior lights and finish up any little things that remain. After a week of no work, everyone got real busy today! Dave started grading, clearing the soil from around the house and putting it around the shop. 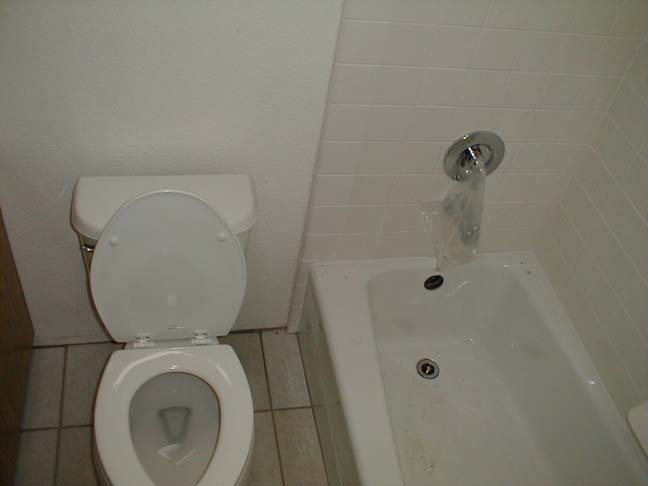 The plumbers were there and got the fixtures in the shower, the toilet and one of the sinks in the Master Bath. 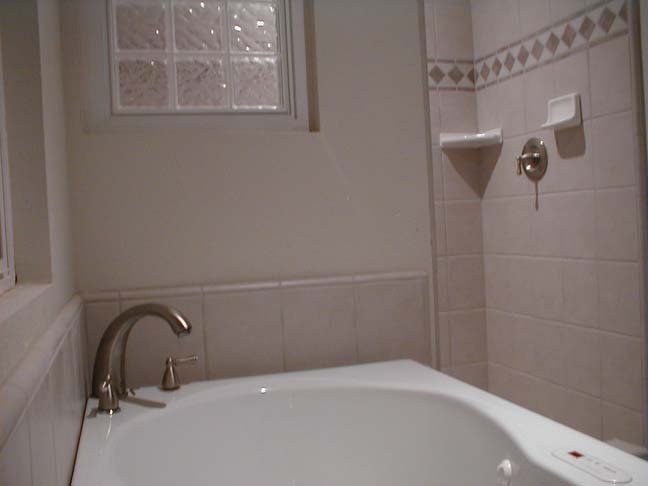 In the Hall Bath, they got the sink and the toilet and fixture in the tub/shower. 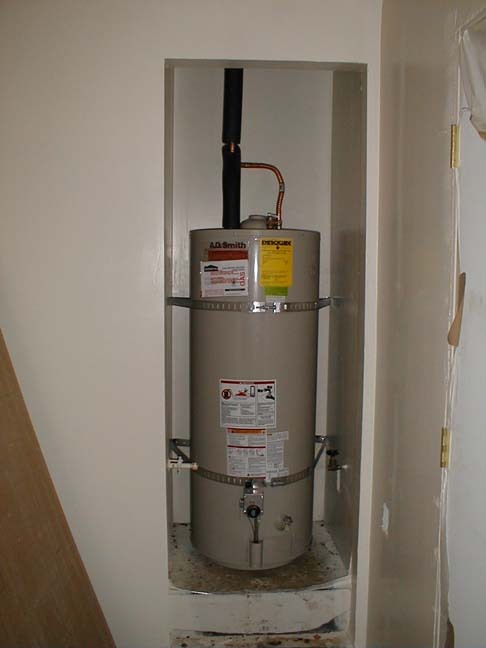 The new water heater was also installed. 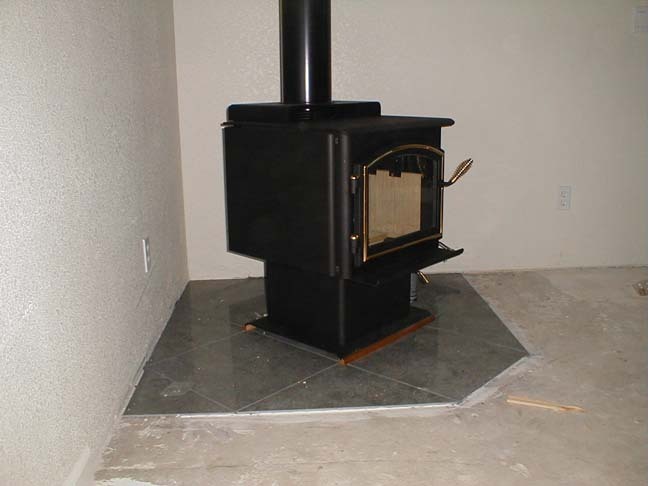 The wood stove was also installed, it sure has a long chimney. I realize that it looks like the smallest stove ever, but it has a large firebox that will take an 18" log. 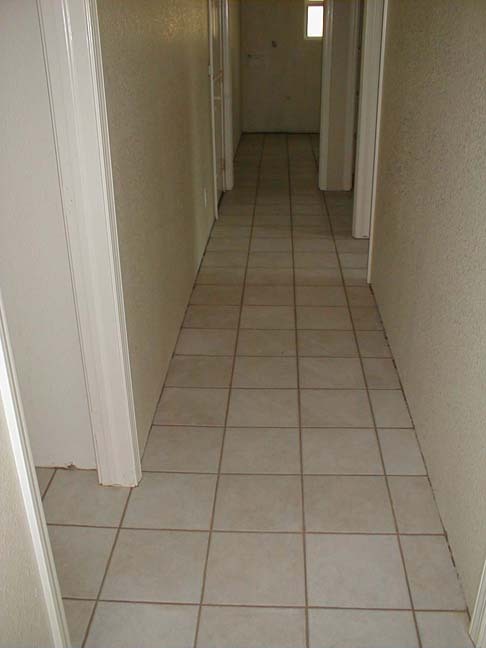 2/17/03 The tile guys have been here all week and finished up all the tile in the addition today, it looks great! 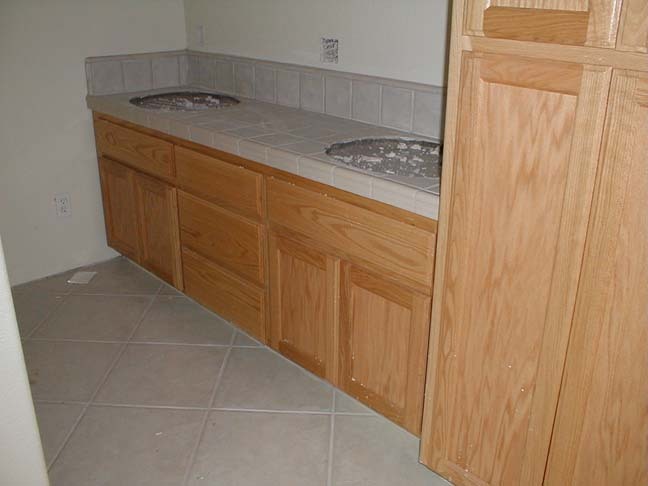 Here is a shot of the Master Bath looking towards the shower, the tub is to the left of the shower; and one looking at the Master Bath counter. 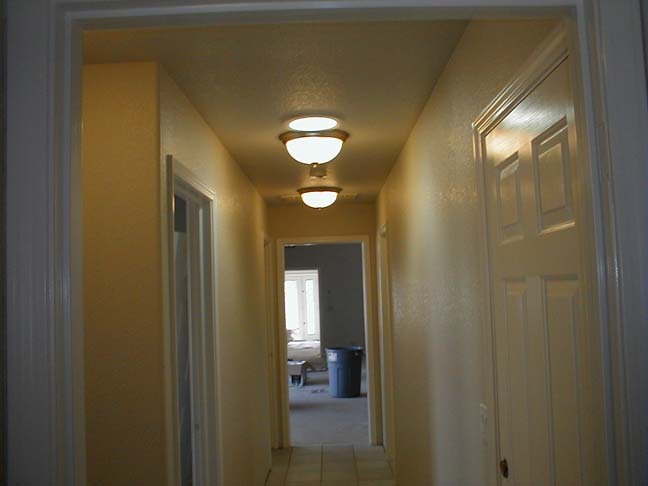 Here is the Hallway and the Guest Bathroom. 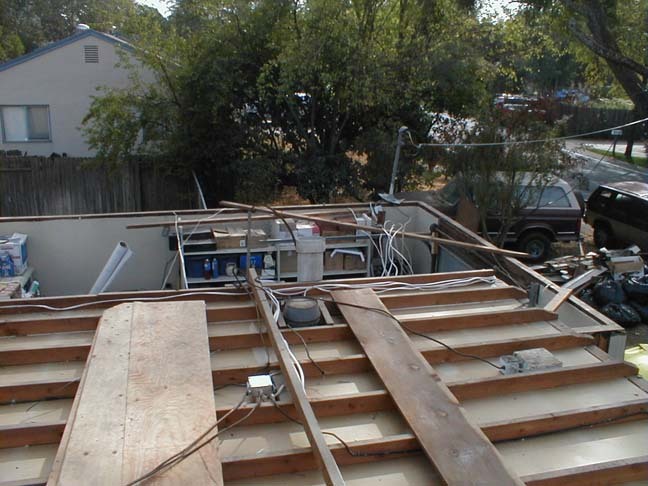 2/16/03 The electricians showed up today for an hour or so and hooked up some outlets and switches. We now have electricity in the addition, so everyone is not forced to use the one extension cord I ran from the old garage. 2/5/03 Dave got the solatubes installed today. 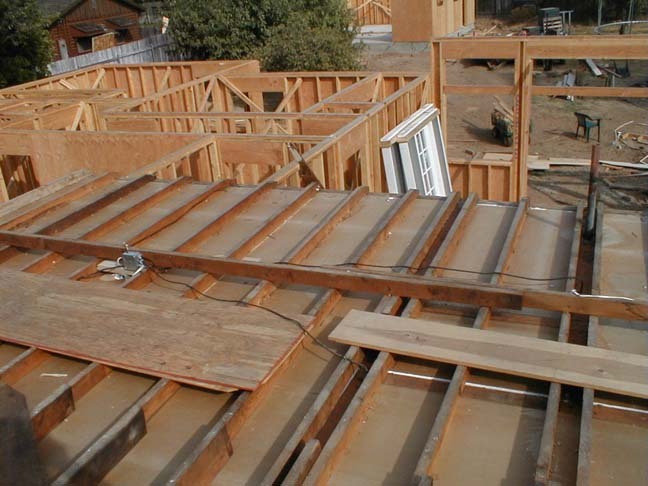 They are small skylights that will provide natural light in the hallway, the hall bath, and in the master closet. I haven't been home when it was light out yet, so pictures will have to come later. The tile guy also got the concrete base for the tile in the master shower applied. 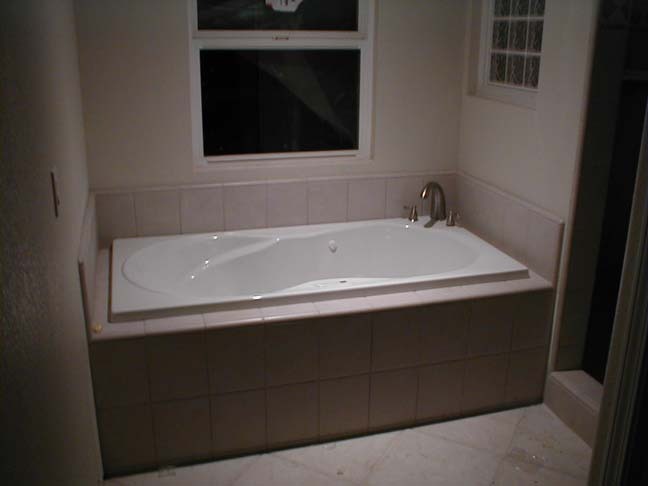 In the picture you can see the cutout for the bathtub. 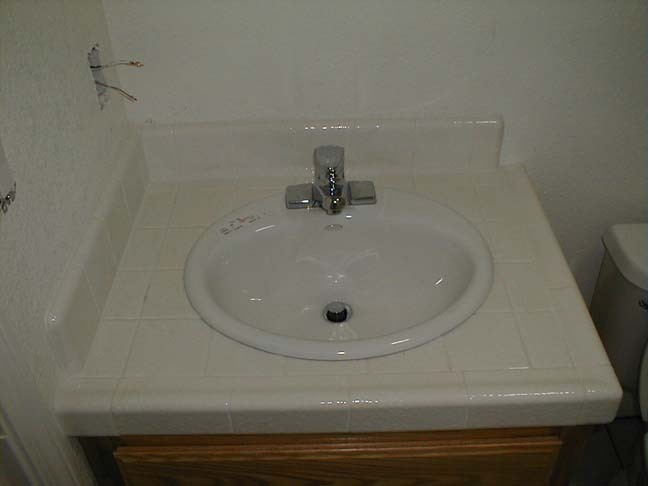 The tile was applied in the hallway bathroom, both the tub and the sink. 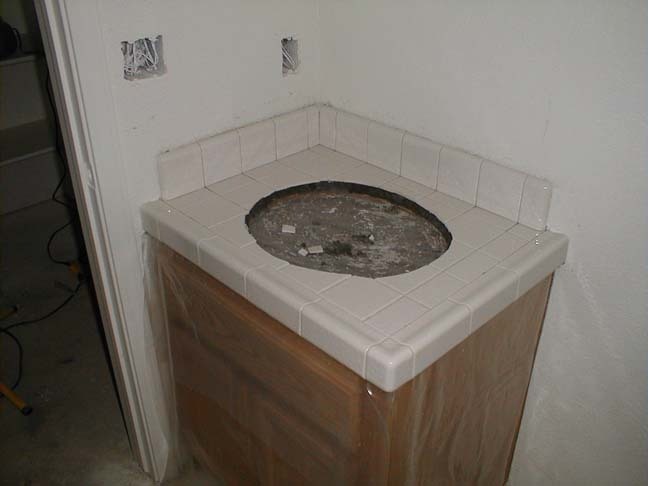 The master sink and shower got chicken wire applied to hold the concrete base that the tile mounts to. 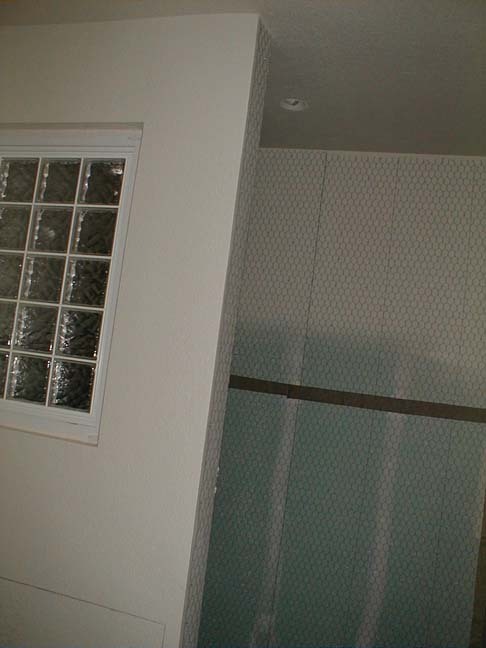 In the shot of the shower you can see the glass block that provides some light as well as the recessed light in the shower. The shop was also painted. 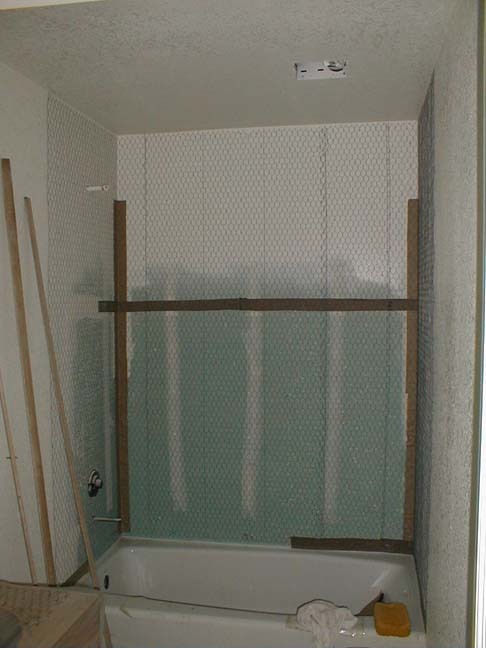 1/31/03 The chicken wire was installed in the hallway bathroom. 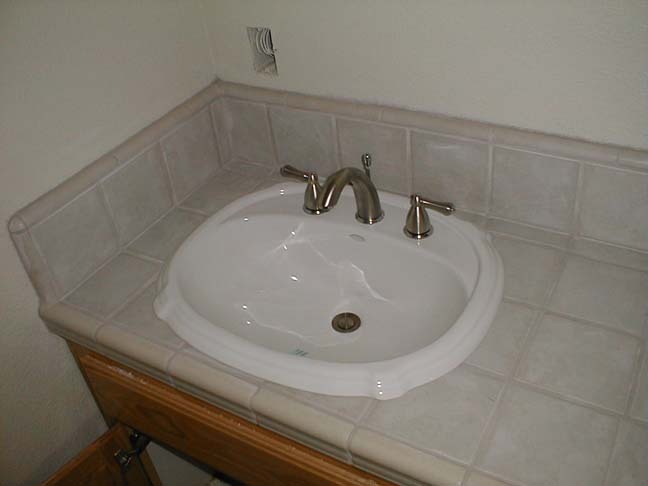 The tile guy did both the tub and the sink. 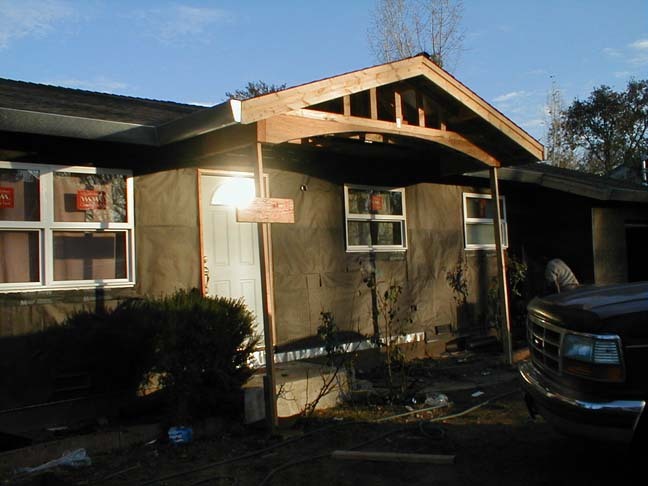 1/28/03 It was a beautiful day and they got the eaves of the house and the trim on the outside painted today. 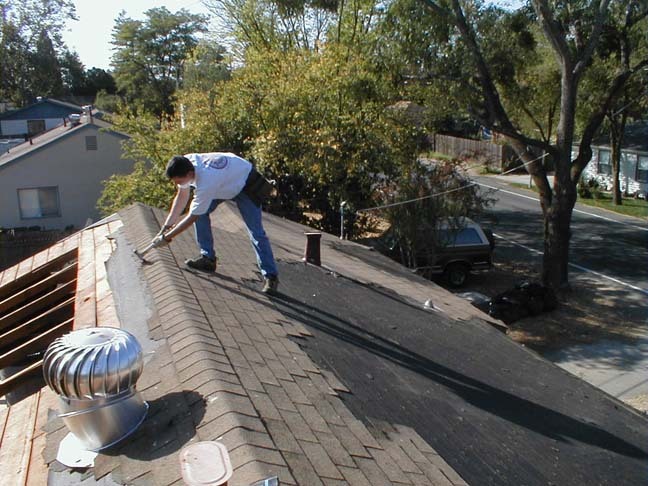 It is a Charcoal color that looks great with the roof! 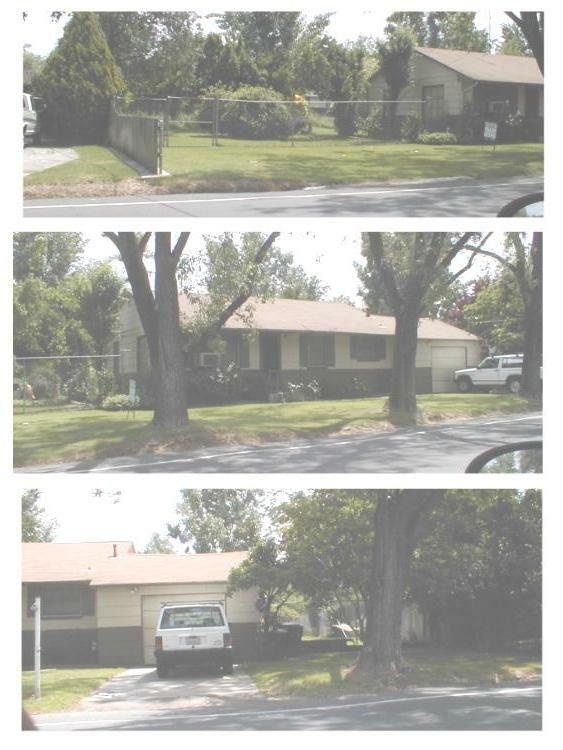 It is hard o see, but here are a few shots of the house. The color at the bottom of the wall is what the stucco will look like. 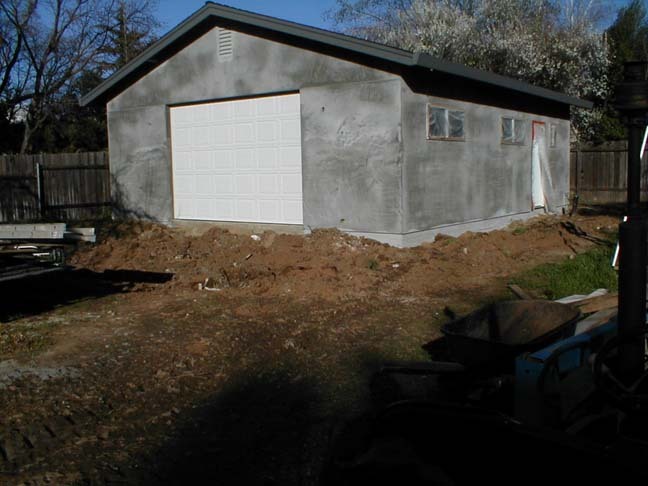 1/24/03 The paint was applied to the walls today, the old and new garages were also painted, it looks good! 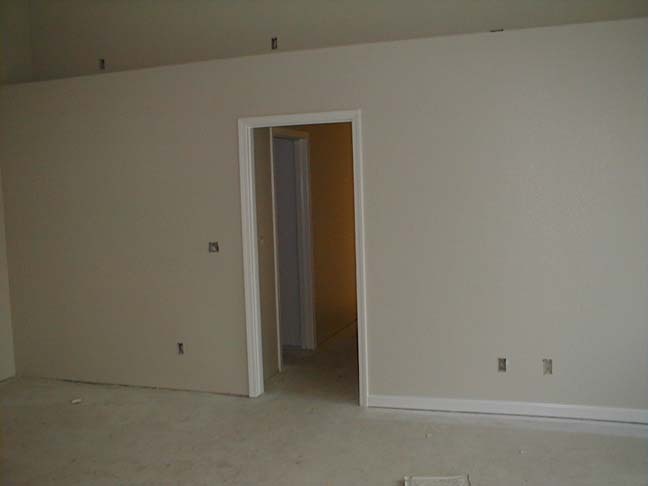 The walls are Bone with White trim. 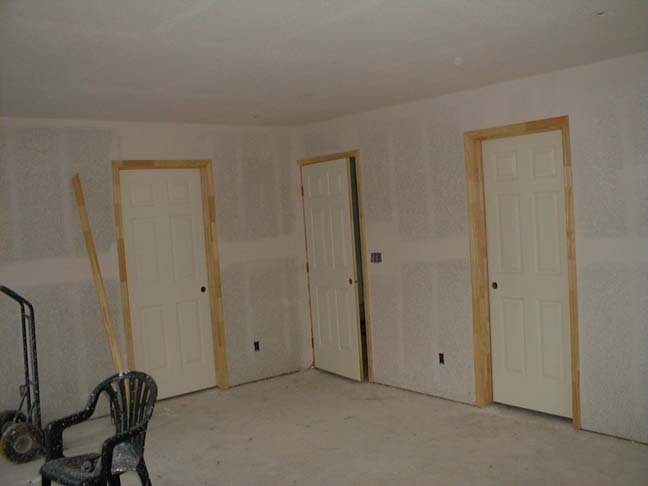 Here is the Craft room, we had all the closets done with the trim color to lighten them up. 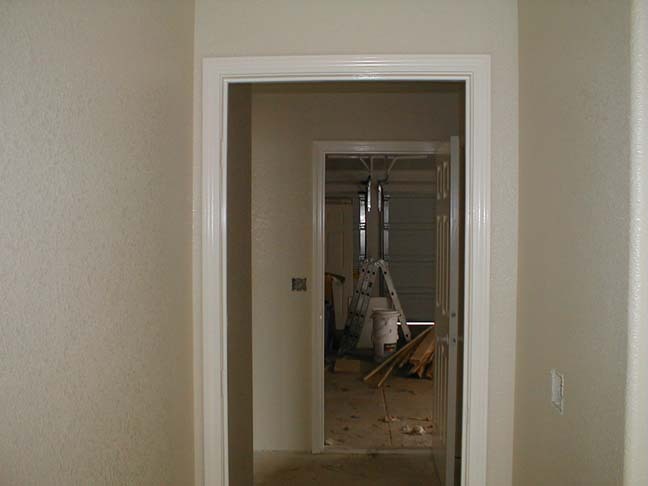 1/23/03 The painting should continue today and hopefully the wall paint will be applied! 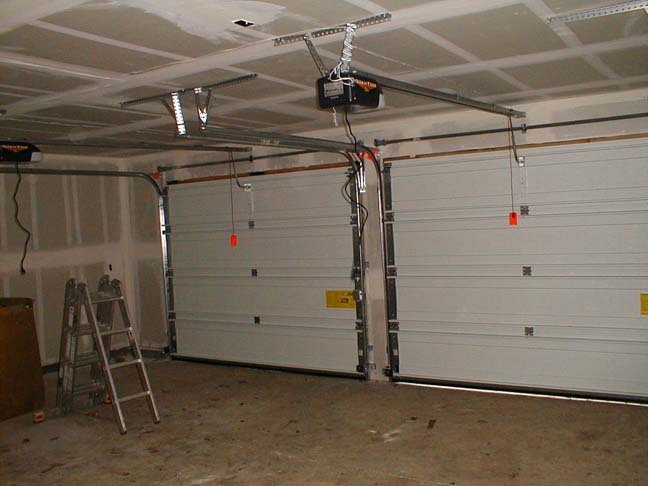 The Garage Doors were installed today. 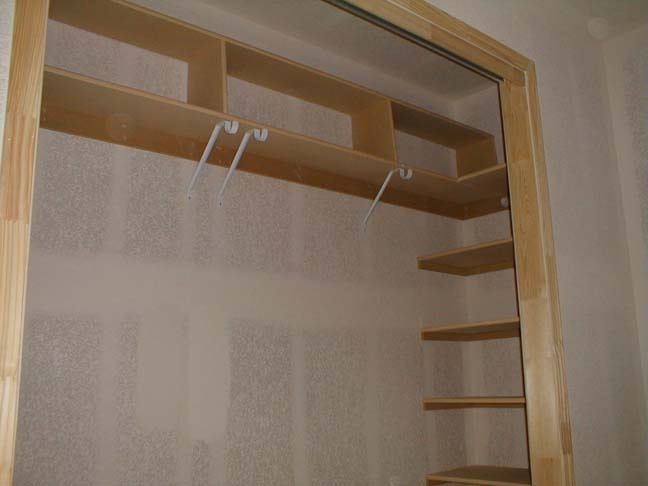 Dave got the shelves in the Master Closet and installed the cabinets in the Master Bath. 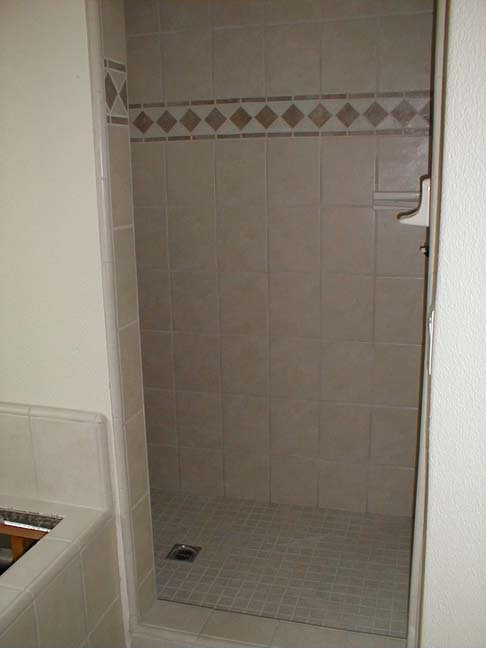 Sandra and I spent more time making the final decisions on the tile (we finished paint decisions 1/15/03). We are very glad those decisions are through! 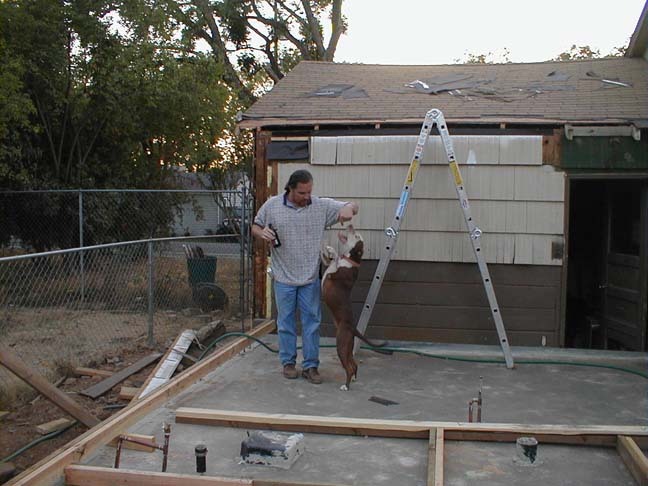 1/16/03 The stucco guys needed better access to do the side of the house by the dog run, so I stayed home and took the dog run down for the day, this also meant that I had Honey (the dog) with me at all times. She had a great day! Dave was also at the house putting in the closet shelves. 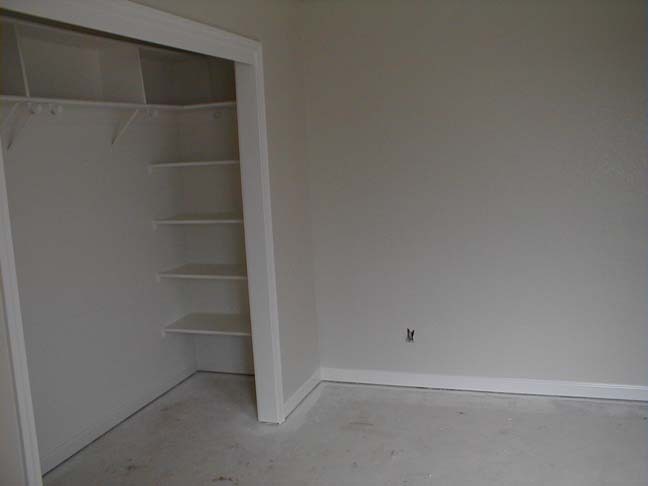 This is the closet for Sandra's Craft Room. 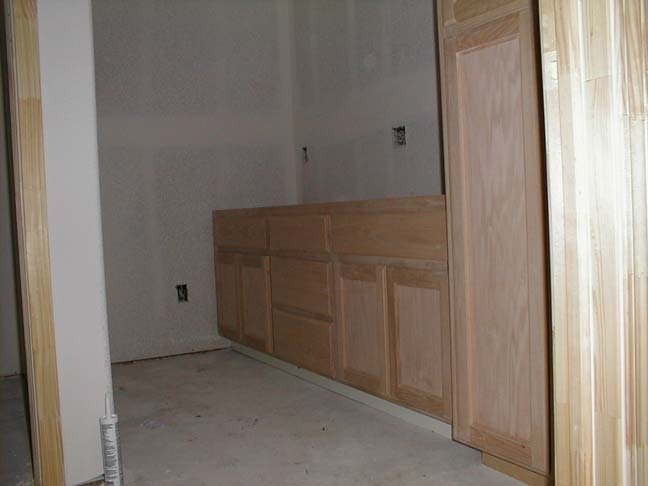 The bathroom cabinets arrivedd today and will sit in the garage until installation. 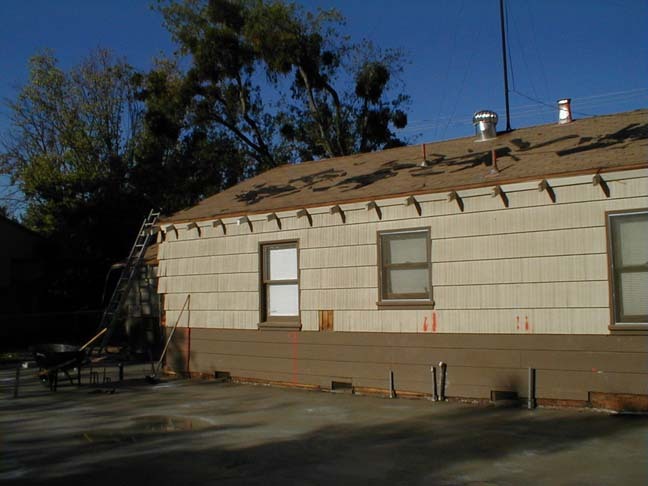 The stucco guys came and started the brown coat. Dave got most of the doors installed. 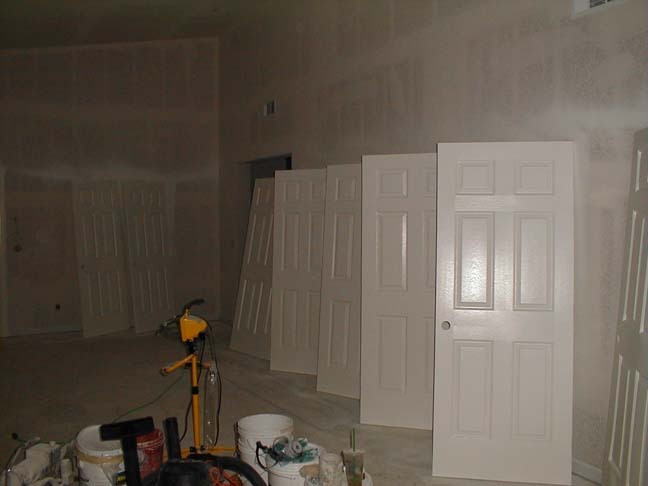 1/14/03 Dave got his tools set up and started installing the rest of the doors in the house. He finished the master bedroom and family room. We are making our decisions regarding paint and tile style and colors and should have final decisions this evening. 1/10/03 We have heat! The interior doors were delivered yesterday and Dave got the door between the garage and the addition installed and got the heat hooked up today. It is amazing, we cranked it up to the low sixties and felt like we were in heaven! 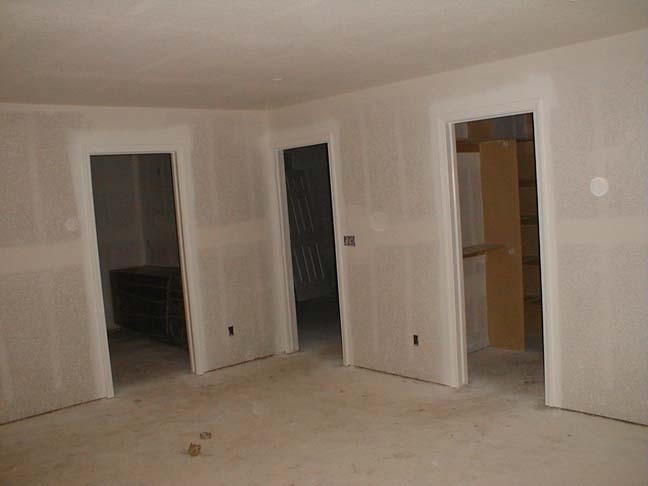 1/7/03 The sheetrock crew came back and textured the house. It is definitely looking like a house now. 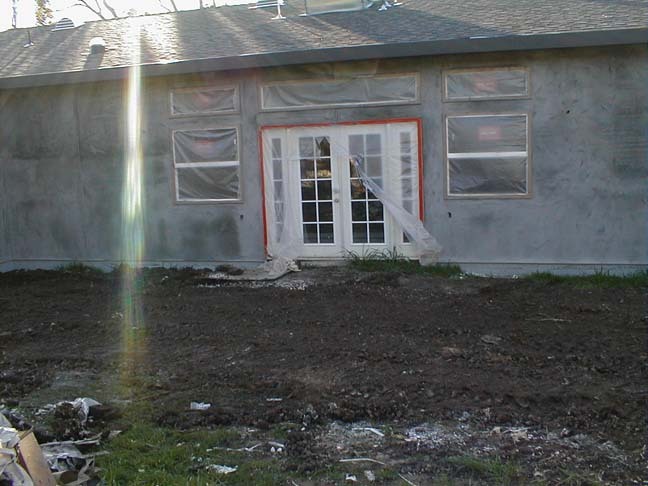 1/3/03 The scratch coat for the stucco was started today, they will finish it on Monday. They finished the scratch coat on the shop. 12/27/02 Although around the windows was still wet, they crew came back today and ran another layer of mud along the seams. 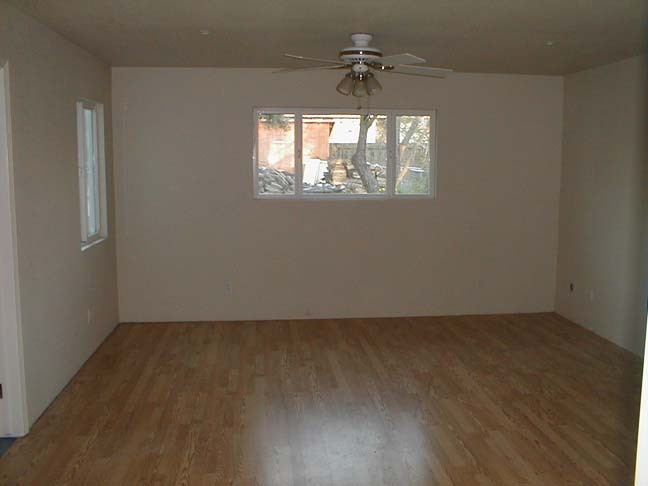 Here is a shot of the Master Bedroom. 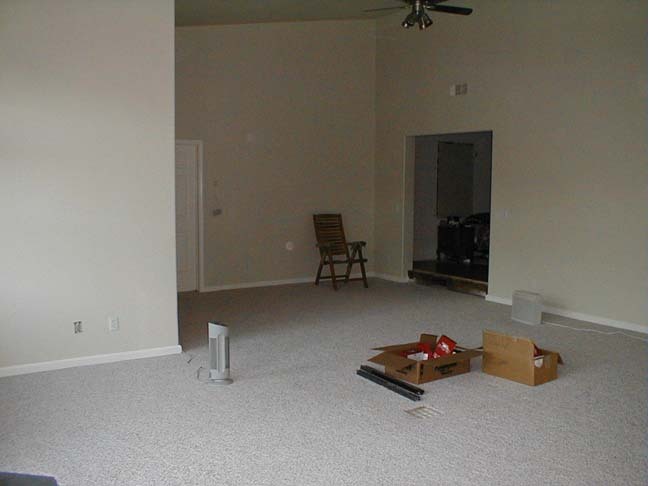 In this shot of the Family Room the shelf is plainly visible as are the mini-lights in the ceiling, the wires haning down are for the surround speakers. 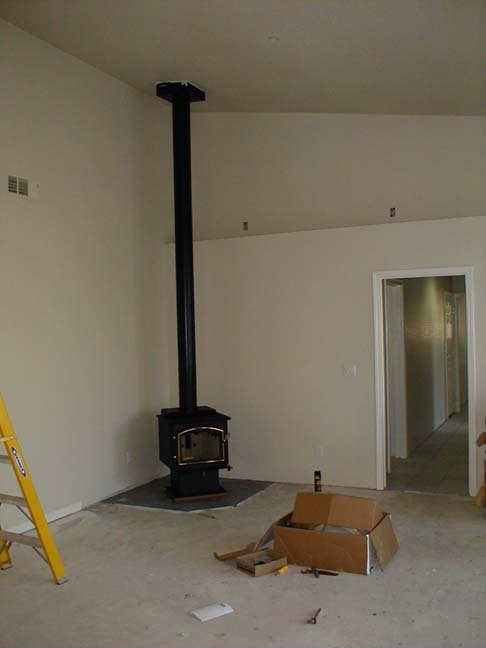 In the corner of the Family room is where the freestanding woodstove will be, you can see the chimney box in the ceiling. This is looking toward the Master bedroom. 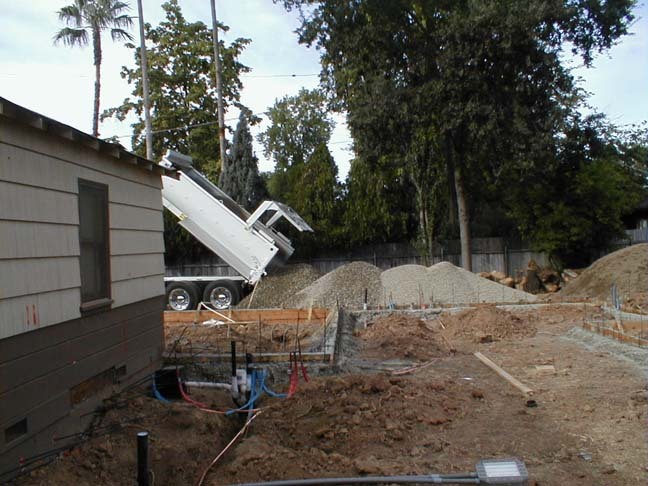 Here you can see the entryway connecting the existing house with the addition. This is a view of the one of the bedrooms. 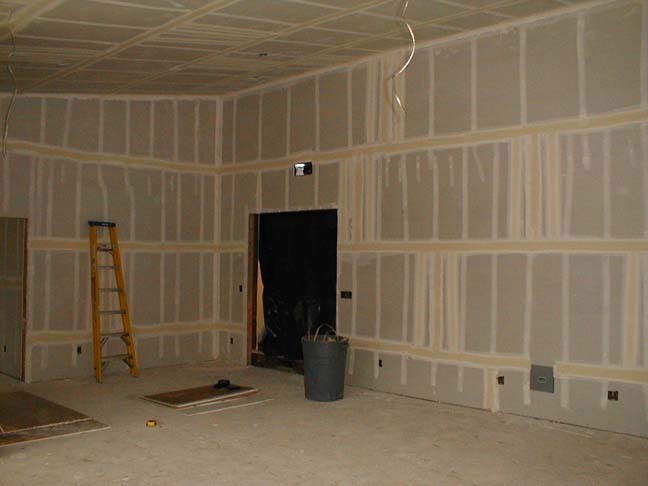 12/26/02 The sheetrock crew showed up today and taped the seams and filled in the nail/screw holes. They also started working around the windows. 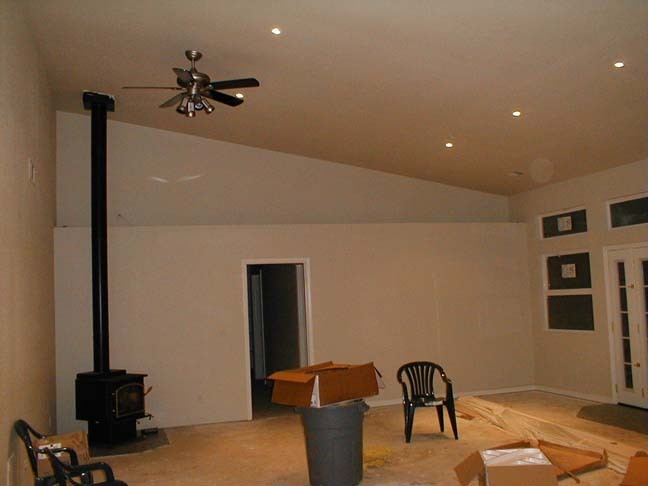 12/20-23/02 A different sheetrock crew came today and started by hanging the ceilings of the house, all except the family room. Then they got working on the walls and finished up on Monday. The house and shop were completely 'rocked in time for Christmas. Tape and texture should start next week. We are getting much closer to having heat in the house now! 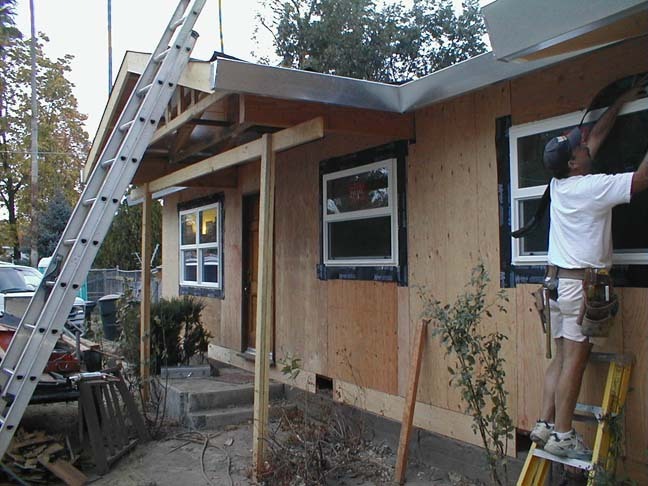 12/19/02 The 'hole' between the existing house and the addition was cut in. We now have a 6' doorway leading into our bedroom. Nights certainly feel colder now! 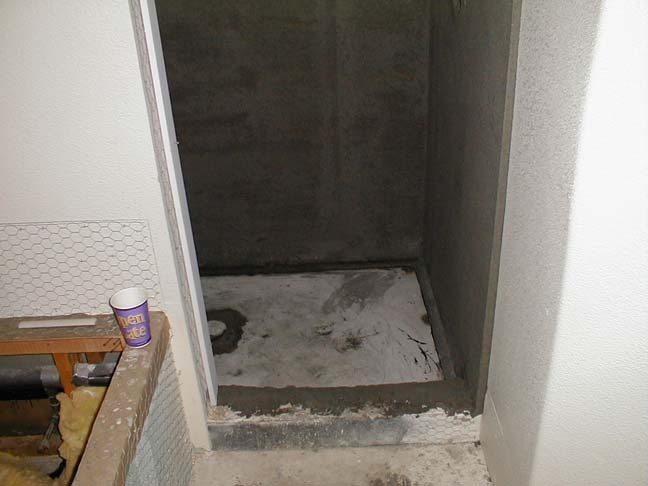 12/16/02 The flashing around the gas and electricity for the HVAC unit had not been caulked, so there was some leaking through the insulation. Dave came by and took care of the leaks. The sheetrockers didn't show up today. It turns out they also install snow chains, and with the storm that came in over the weekend, and the fact that installing chains pays better, well they opted for the better pay. Gotta love a Free Market economy! 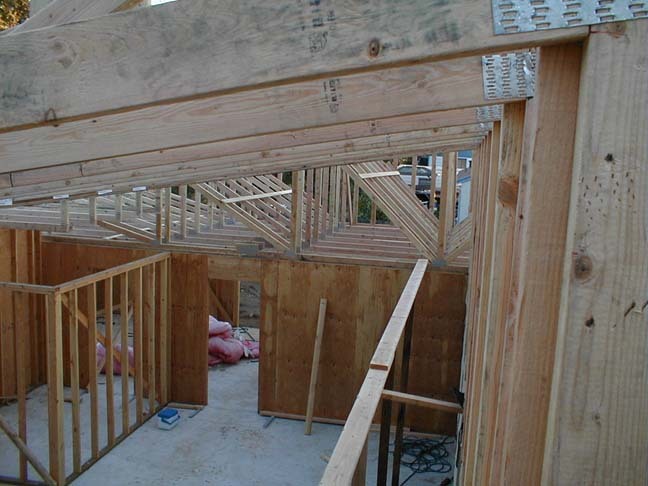 12/13/02 The framing inspection was yesterday and went off without a hitch, no callbacks! 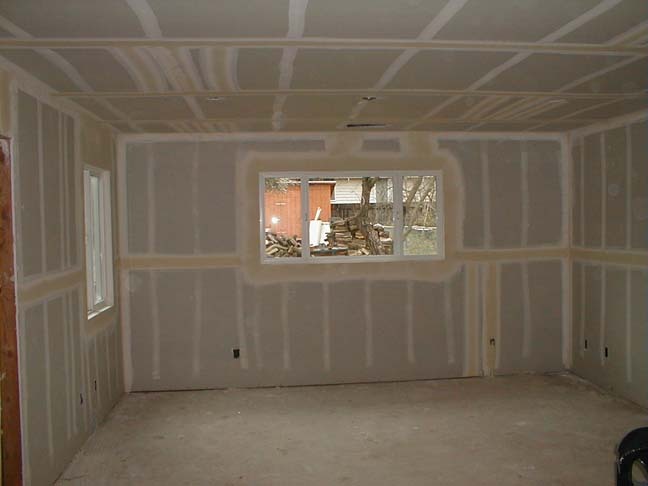 I finished running wire last night and the insulation was put in the walls and the ceiling of the family room today. 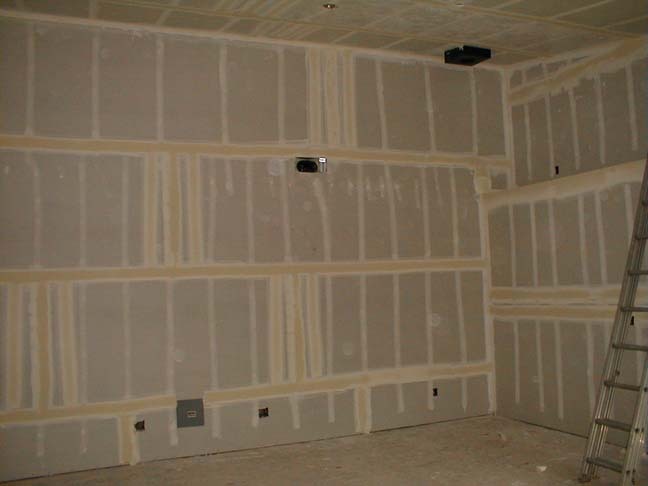 The acoustics of the place really changed once the sound deadening insulation was put in. 12/10/02 Unfortunately Dave is sick, however he still scheduled the framing inspection for Thursday, there is still quite a bit of work to finish before then. There are approx. 8 lights left to be set, the window needs to be framed in the tub/shower area of the master bath and I need to finish running the a/v box and conduit in the shop. Once the framing inspection is cleared, we should have insulation rolled out on Friday, it will be so nice to have at least some insulation! 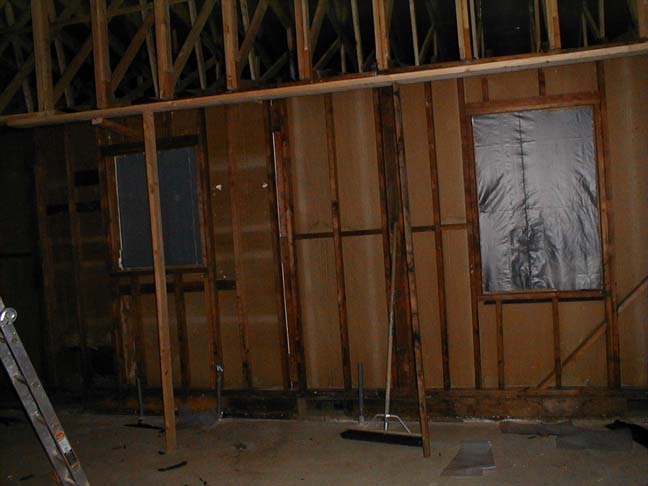 12/6/02 The framers were back today to put shear wall (sheeting) on the big wall in the family room. Any twisted or warped studs were replaced or fixed today also. 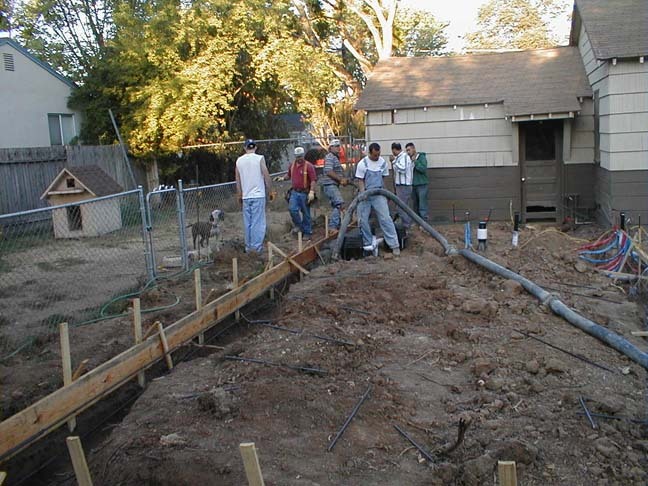 11/5/02 The sewer trench was inspected and covered back up and the shop has been wired for power. The tall wall in the family room will be covered up tomorrow, so I had to finish running conduit and setting the a/v box for later use. That got finished up close to midnight, not a fun evening! I also made sure to take a video of the wall before it got covered so i will know where wires are after everything is covered up! 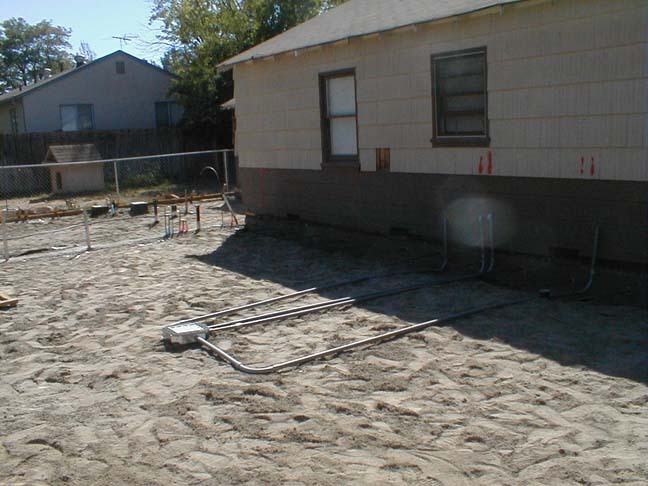 12/4/02 Dave dug a trench in the front yard to run the new sewer main out to the street. The sewer was run out the same day. The water and sewer were also run out to the shop. 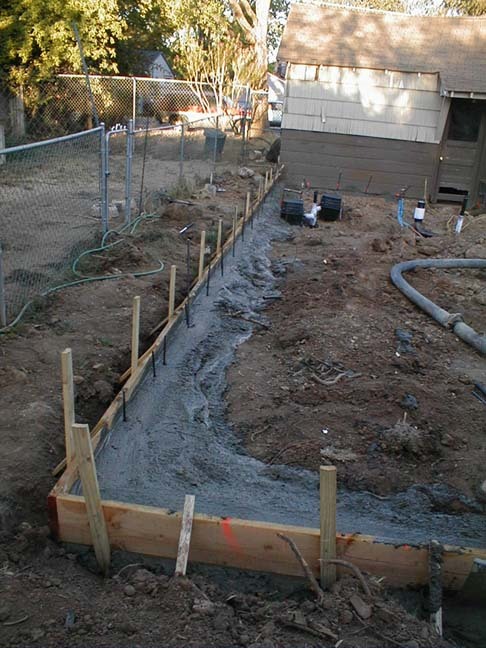 11/29/02 The plumbers tapped into the water main and now the addition has water. 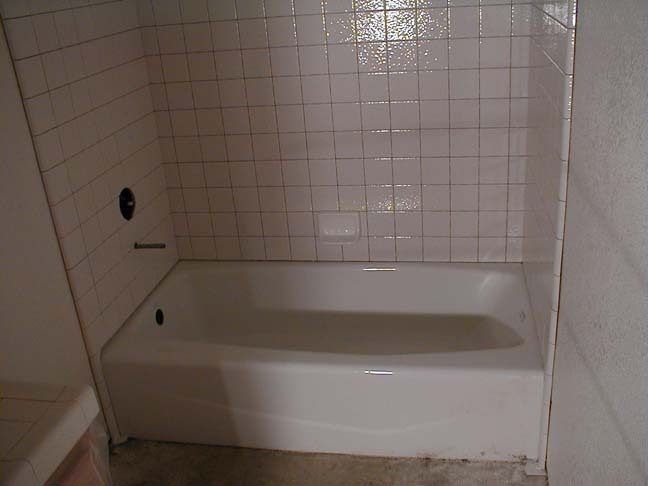 Other work was done on the plumbing also: the shower was set in the shop and the tub was set in the spare bathroom. 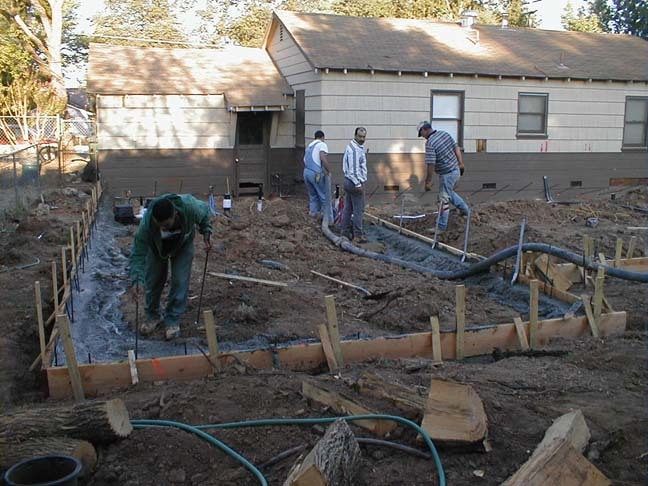 11/27/02 Two large trenches were cut in the backyard today to link the house to the shop. 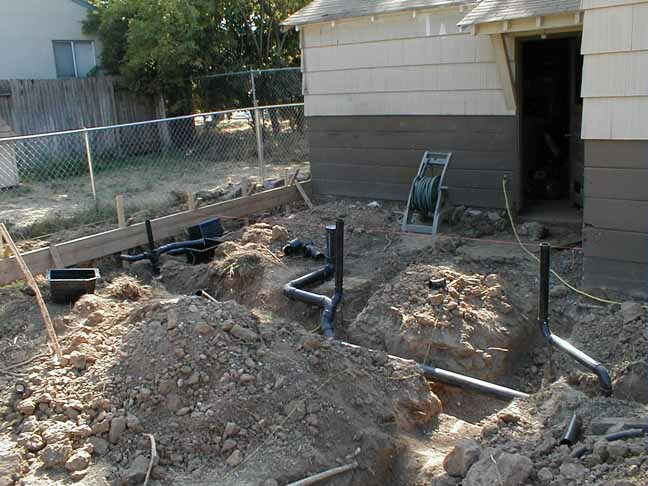 The plumbing will be run in one trench and the electrical in the other trench. 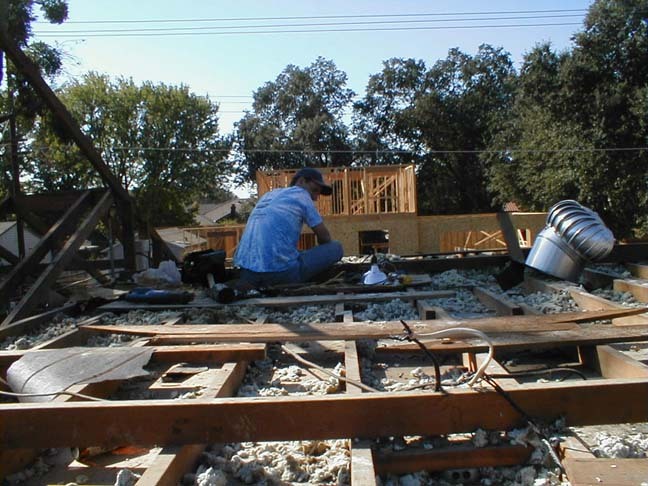 11/21/02 The electricians pulled the wire for the house and will be back next week to finish the house and get started on the shop. The plumber got the gas line run for the central heat and air. The stucco crew got busy putting the wrap on the house. 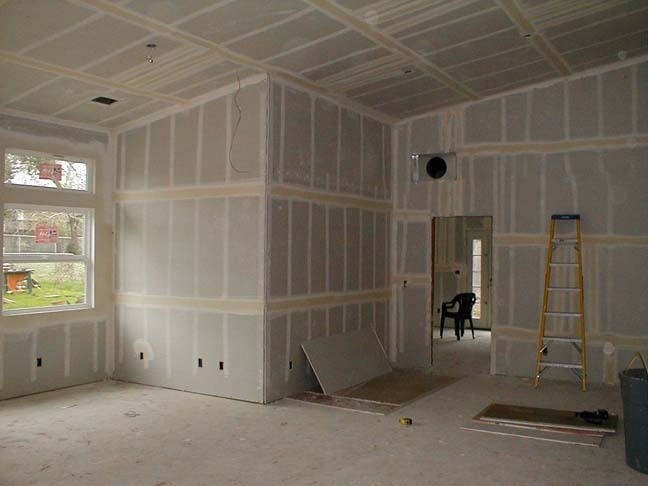 The house will sit looking like this until the sheetrock is hung, then they will start the actual stucco process. The new garage looks large! 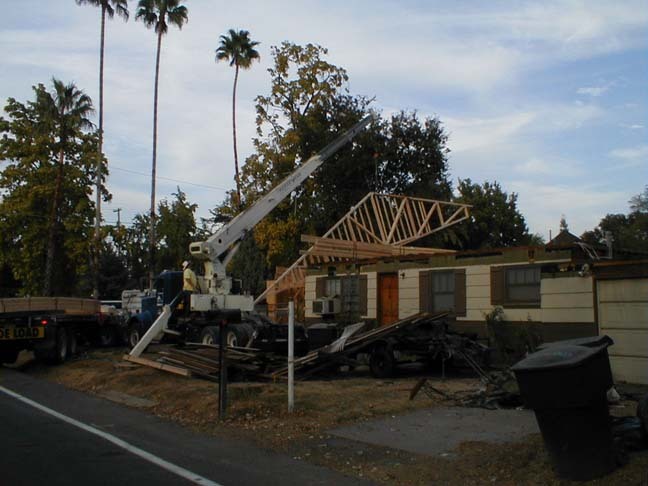 11/18/02 The electricians got most of the boxes set and will be coming through later to pull all the wires. The stucco wrap was delayed for a few more days. 11/7-16/02 Over the last week or so a lot has happened, just nothing really picture worthy. The HVAC guys got all the ductwork in, the plumber got all the drains and copper in. Dave got most of the doors that open to the outside installed, including the new front door. Dave also created the arch that is at the top of the front porch, and got the windows installed in the shop. The pile of debris in the front yard got hauled off reducing our 'white trash' appeal. 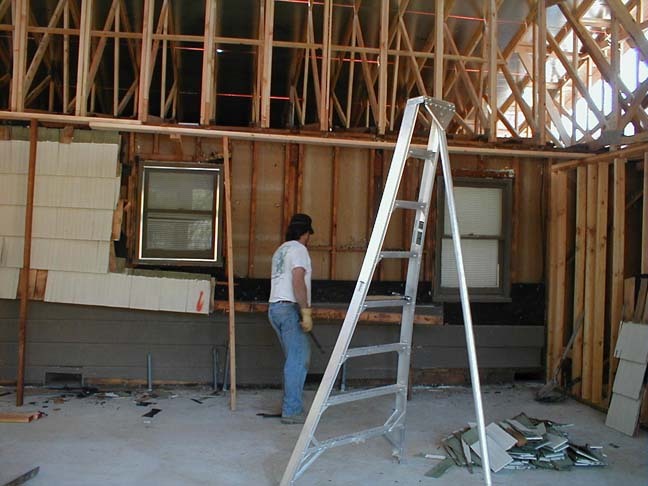 11/6/02 We finished stripping the front of the house and pulling the windows out as the sheeting was started at the other end of the house. 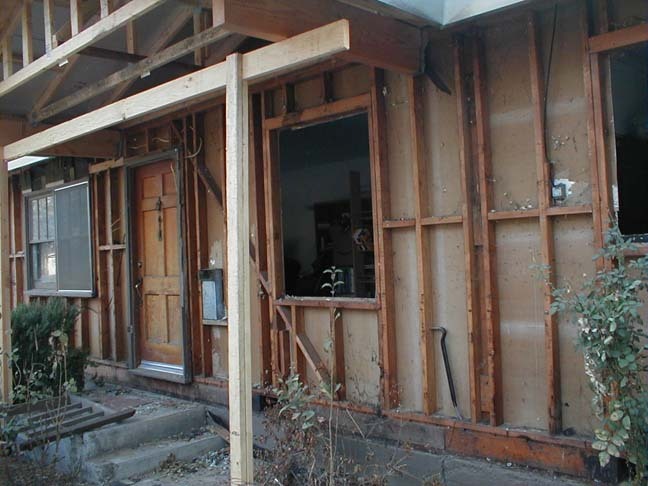 Dave installed the remaining windows in the back of the house, then he framed the openings for and installed the new windows in the front of the house. All the windows are now installed in the house. 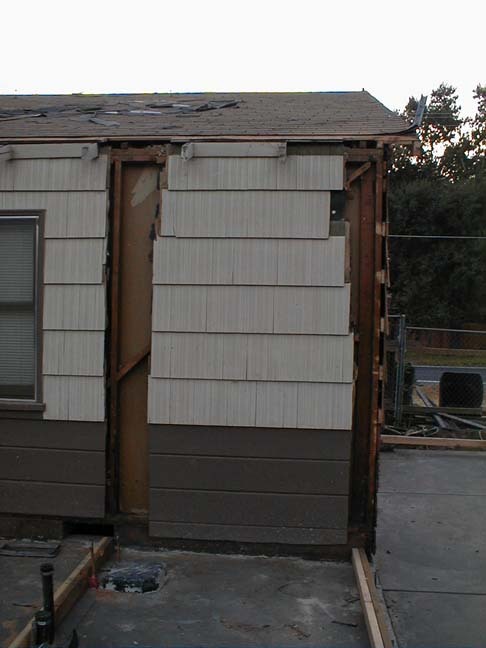 The roofer continued with the back of the house and rolled out paper to make the house rainproof. It is a good thing because it started raining that night. 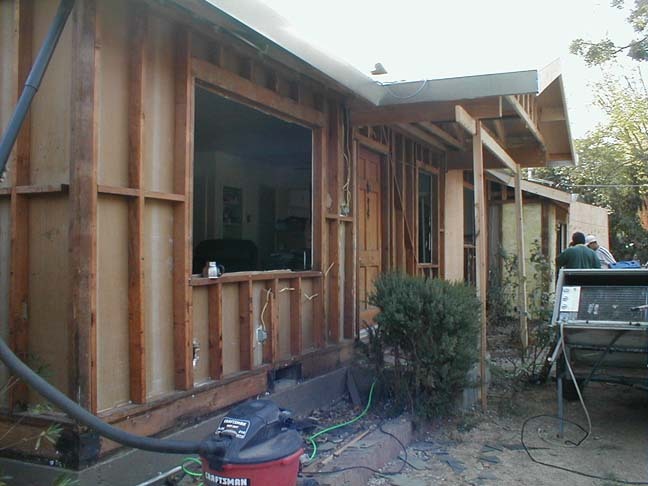 11/5/02 We started stripping the front of the house in preparation for sheeting and the window replacement. 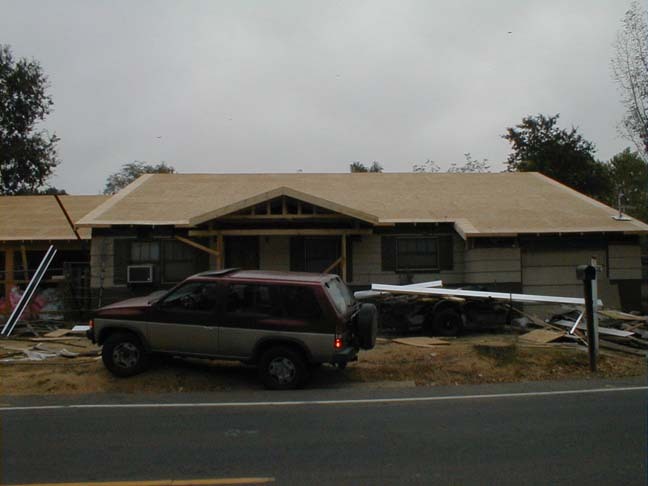 11/4/02 The roofer was back and got busy, the front of the house is done, so we are safe from rain (the exsisting house is covered by the front of the roof). We started clearing our belongings inside of the house away from the windows and doors as they should be replaced tomorrow. Sandra's parents came down for the second weekend in a row to haul trash to the dump for us. We finally relented and got a storage unit as the existing garage has to be cleaned out soon. We started loading up the rental unit. 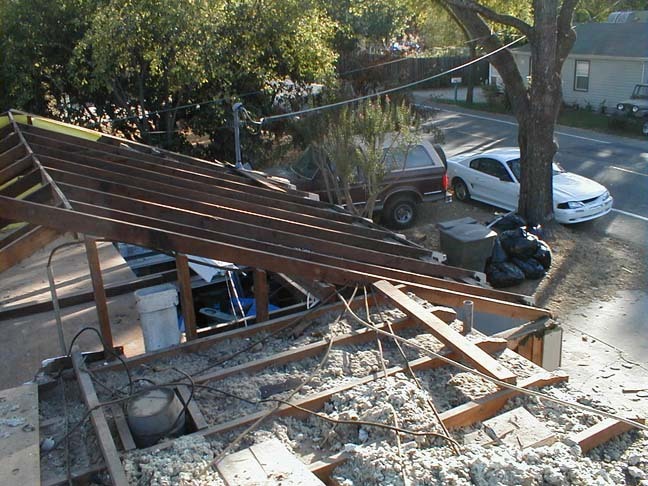 11/1-2/02 The roofer got started on the front of the house, but didn't get very far. 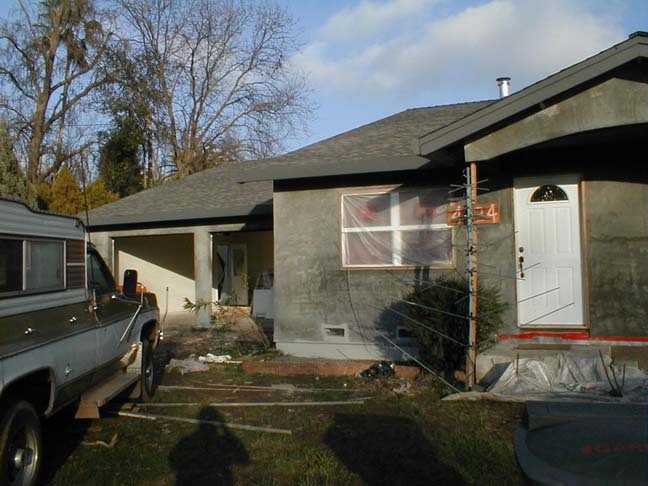 We worked on cleaning up the job site and I continued with re-wiring the existing house. 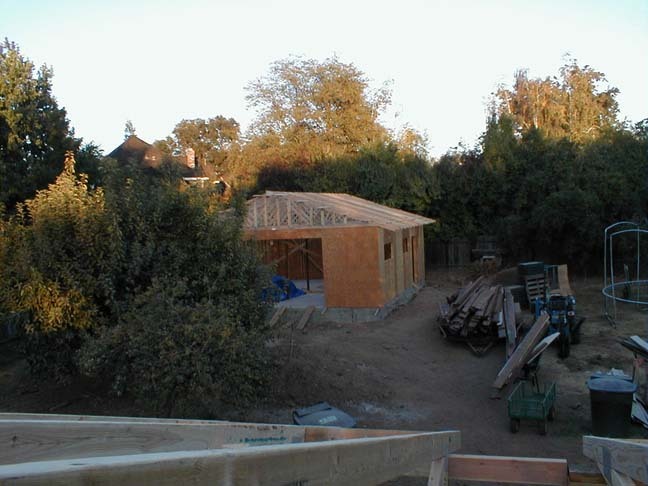 10/29-30/02 The framers came back today and finished up a few more projects: they put up shear wall for the gable ends, built the master closet wall up to the ceiling and they built the wall and opening between the existing house and the addition. 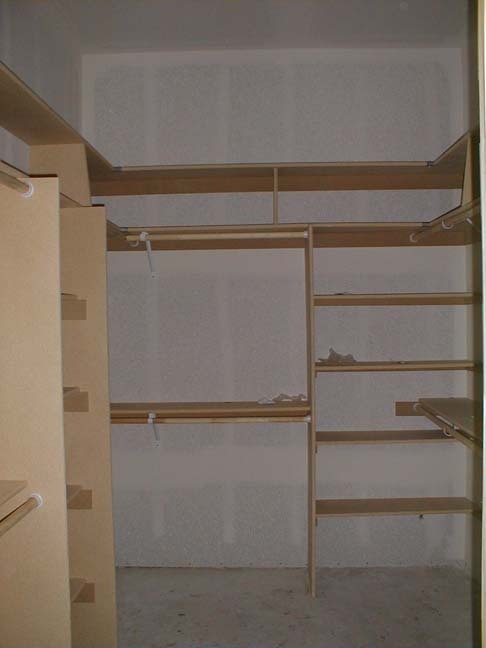 They also built a shelf at the end of the family room at about 9 feet high. 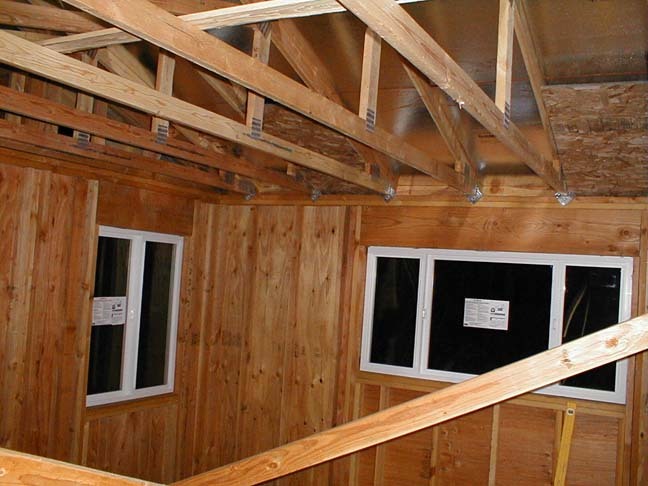 The trusses didn't align and it left the perfect spot to put a shelf that is the depth of the room. 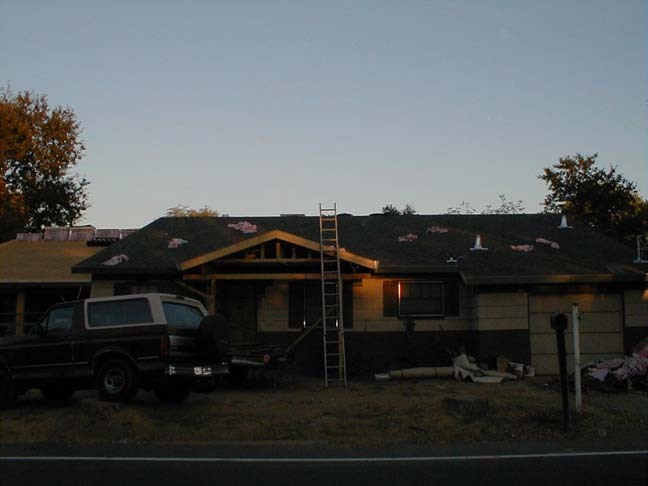 10/28/02 After work I got to come home and removed all the windows from the back of the house. Sandra helped me stretch plastic across the openings. It is really cold at night now! 10/27/02 Sandra is sick and can't help out today unfortunately. 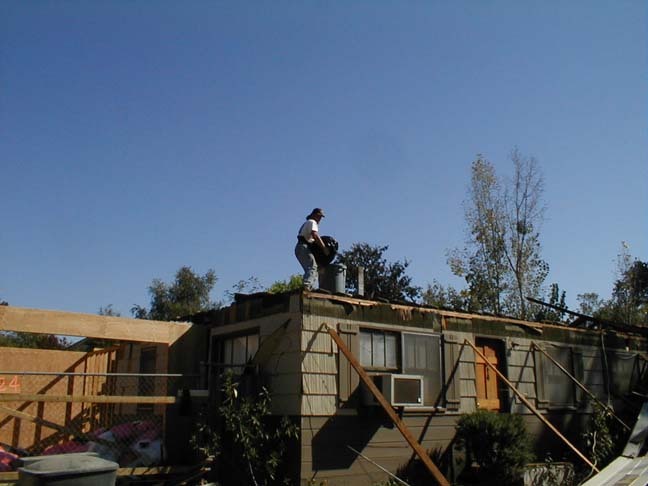 Her parents came by and brought their truck, so we loaded it up for the dump with shingles from the roof. That made a huge difference in the mess. I also got one window removed so if the shear wall is put on tomorrow (in the new garage), the window would not be in the way. 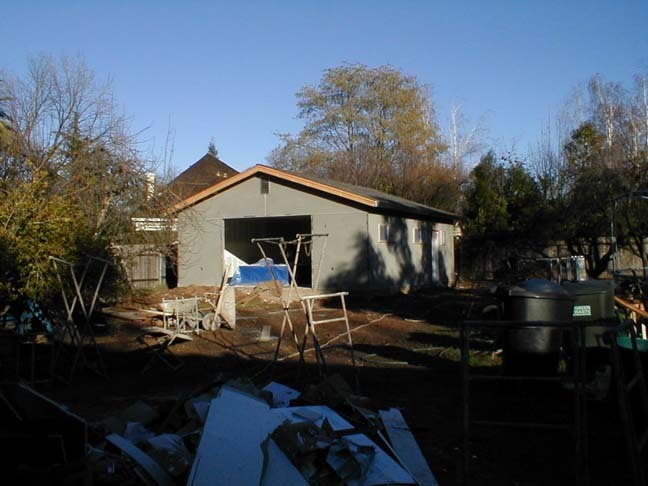 10/26/02 I started stripping all the siding off the back and sides of the house, this was a wonderful way to find all sorts of things that might have been hidden in the walls by scurrying little critters. I actually found a pile of dog treats under the bathtub, the 'thief' was curled up beside them and mummified as the poison information states will happen. I will spare you the pictures of that one though. Shoot me an e-mail if you want to see them. Dad and Sandra cleaned the job site up a ton. 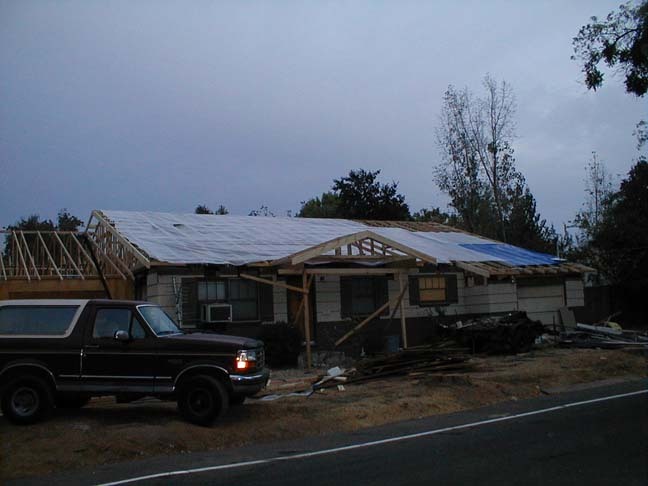 10/25/02 They showed up and got the entire house and shop sheeted in one day, boy is that a relief for us! 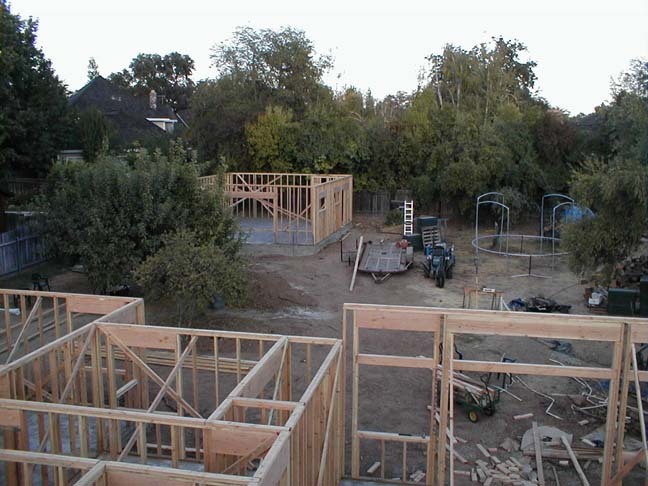 10/23/02 It looks like they finished standing all the trusses, sheeting should be tomorrow! The basic framework of the front porch is up. 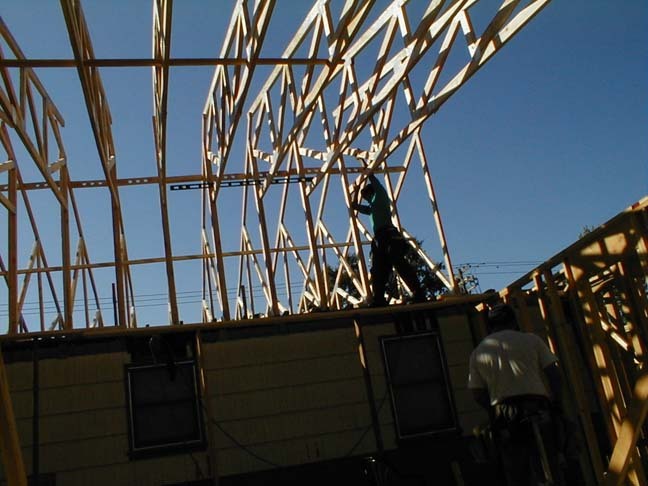 10/22/02 Well the framers got busy on the house today, they stood about 3/4 of the trusses. The family room ceiling looks huge! They should finish the house tomorrow and sheet it on Thursday. 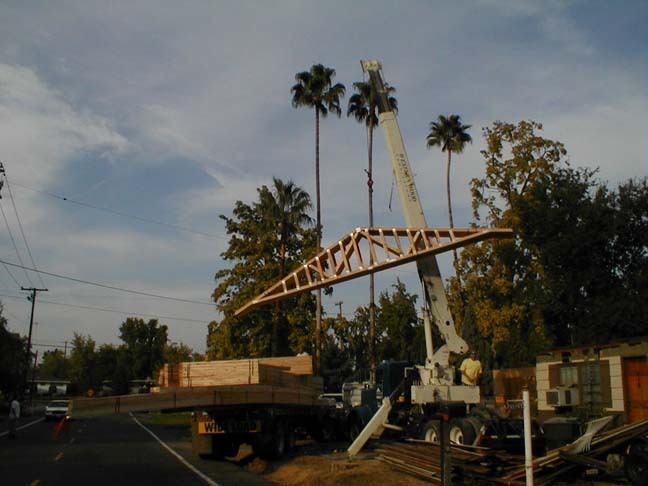 10/21/02 The framers showed up today to start standing the trusses. When I got home, I was somewhat disappointed to see they had only done the shop. 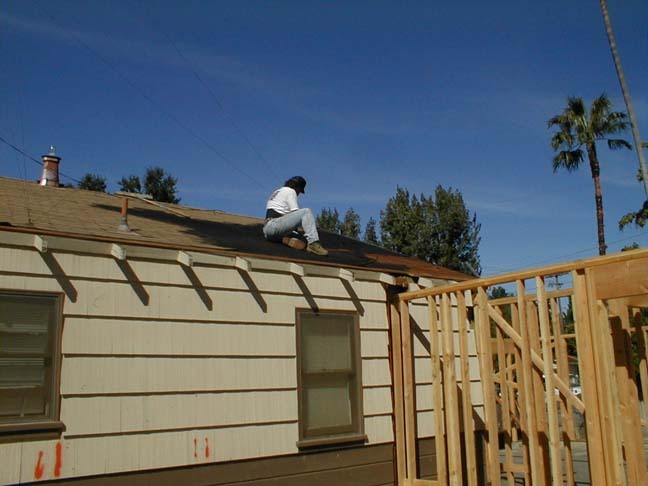 Now don't get me wrong, I was thrilled to have the shop done, but I was looking forward to seeing the roofline of the house. 10/19-20/02 Sandra & I used the 'free' weekend to clean up the job site, you know, our yard. 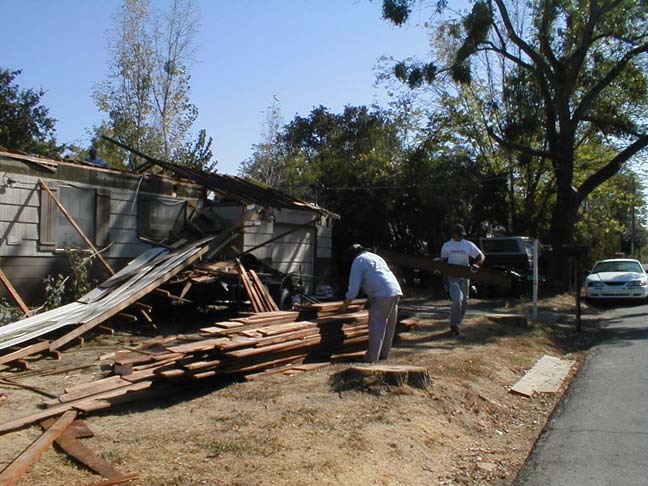 I hauled good wood from the front to the back of the house and debris from the back to the front. We (Sandra primarily) also cleaned up most of the insulation that had been thrown off the roof in anticipation of truss delivery Tuesday. 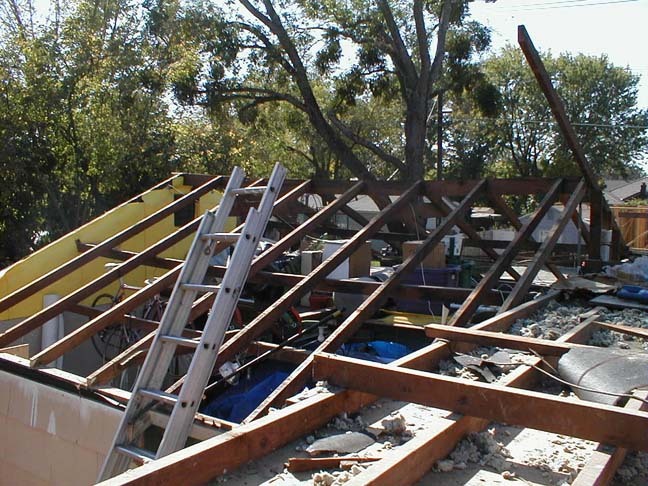 10/18/02 If you pay attention to the date, you'll see that the trusses didn't show up on Thursday as we were told. What we discovered is that with no roof or insulation (2), sleeping at night is just like camping, cold! We also called ourselves the "white trash" house of the block, luckily our neighbors understand. 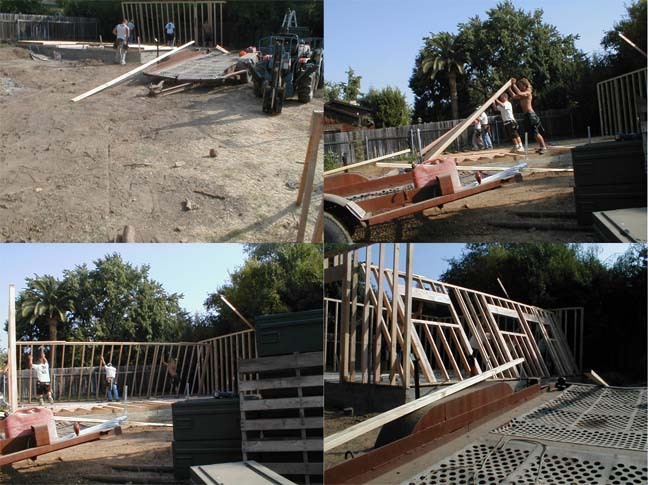 At around 4:30 p.m. the trusses finally arrived. 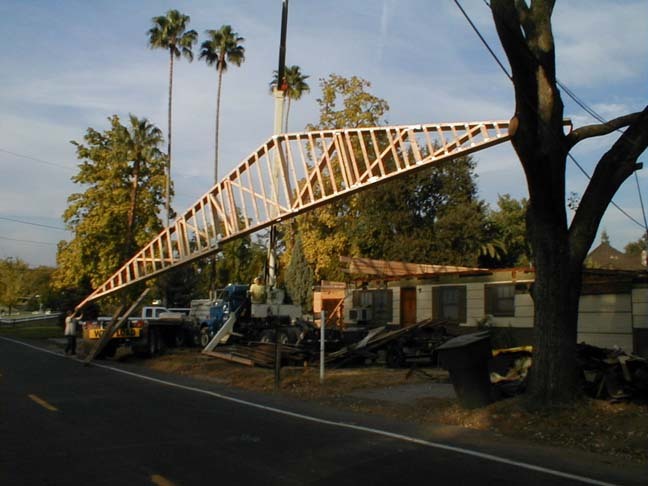 The difficulty was that because of the size of the trusses (the largest (2) are 57 feet plus tails) the street was partially blocked by the truck, so Sandra & I ended up directing traffic instead of just watching in awe. Overall the truss delivery went well and we only ended up with a few holes in the ceiling. 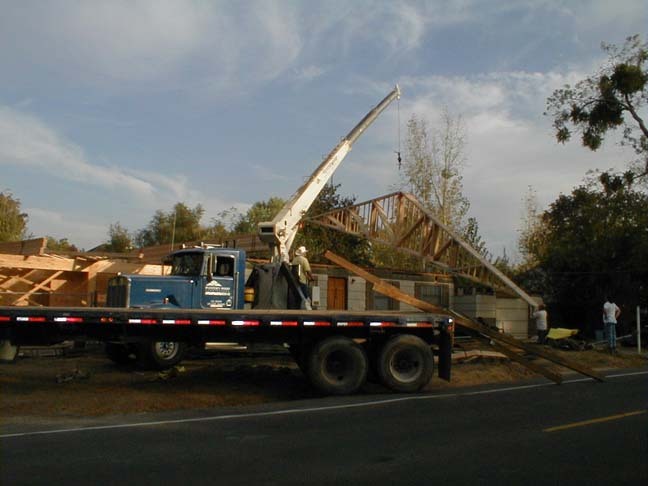 10/15/02 The trusses were supposed to be delivered today, but we couldn't get a time for delivery from the truss company, well about 11 a.m. we found out that the trusses wouldn't arive until Thursday. I used the rest of the day to get all the insulation off the roof and to strip the framework that held up the garage door. 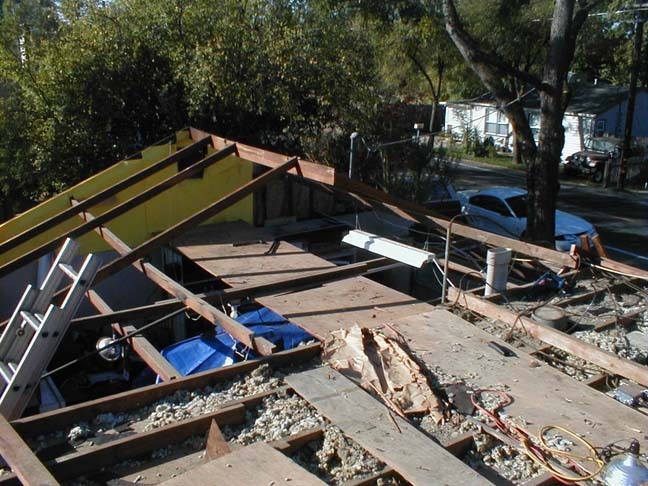 10/14/02 I tore down the remaining framework from the garage and then started working on the insulation in the house. My Dad came by for a few hours and continued to help clean up the ground level stuff. 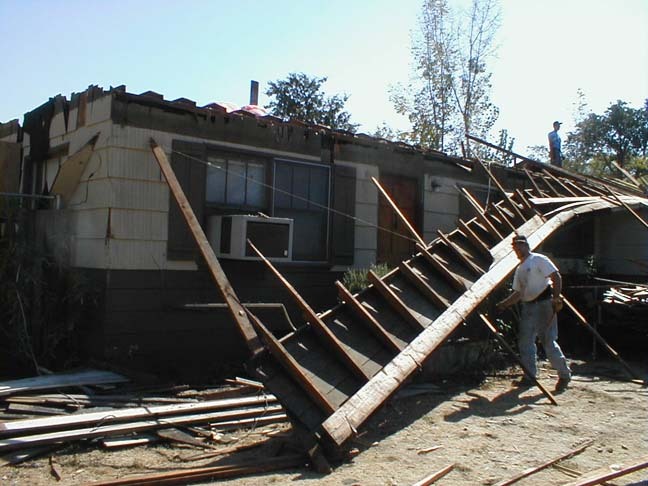 10/13/02 Since we got the house done, and only the garage was left today, I thought it might go faster, once again mistaken. 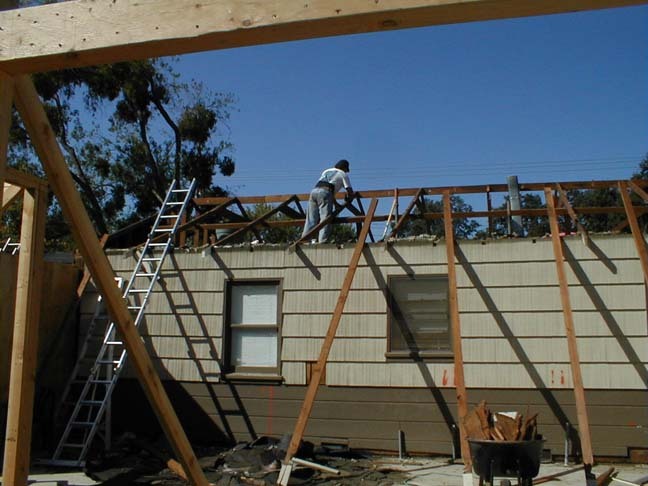 Miguel showed up as well as Mike and they tore off the garage roof as I stripped the remaining structure from the house. 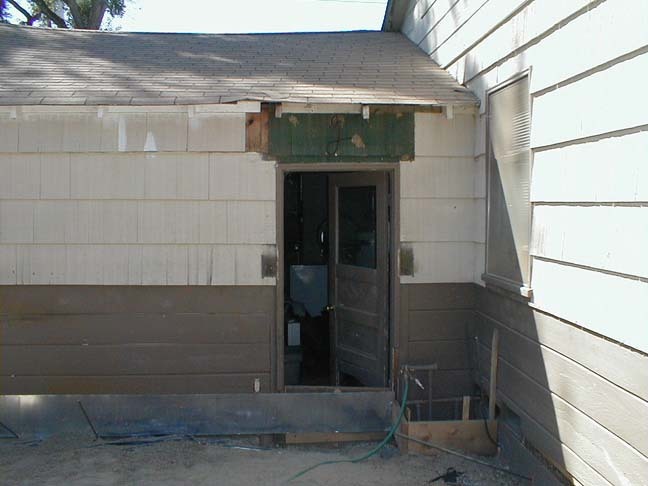 After cutting all the rafter tails, the porch was still up and attatched to the house. I figured I would remove the ornamental woodwork that was at the end, that is when it all came crashing down. Mike spent time cleaning up some of the wiring that was in the attic. My Dad came by for a while also and helped strip nails and staple that were missed as the boards were taken off the roof. I worked getting more of the insulation off the roof. 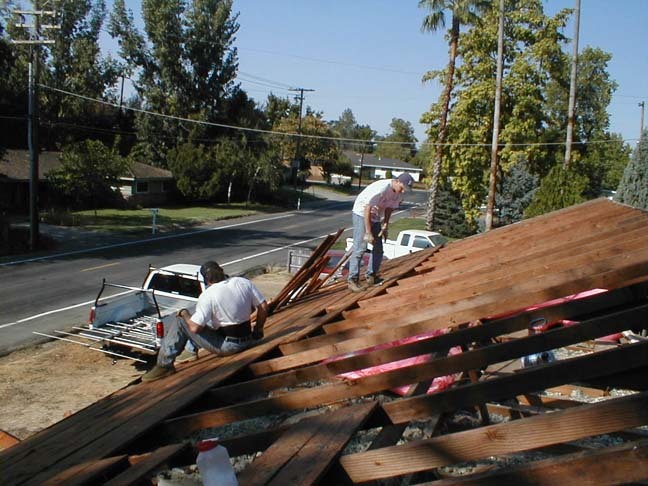 10/12/02 Mike showed up to help out with the stripping of the roof, I figured we would be done in no time, boy was I wrong! 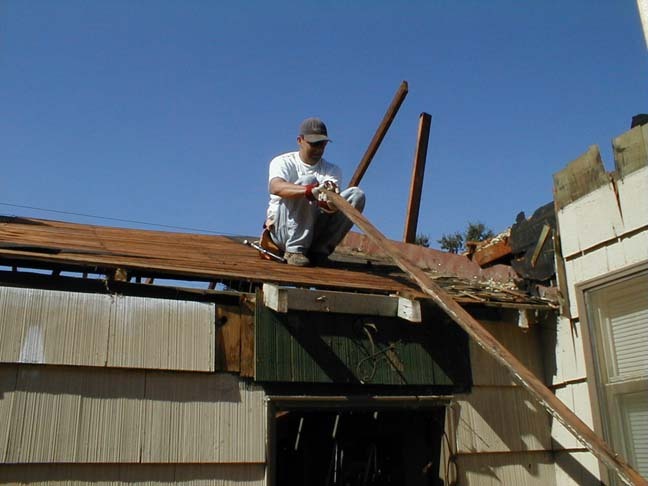 Mike & I worked for most of the day getting the roof itself off, Sandra even helped remove staples. It was exhausting, and I couldn't have done it without the help. 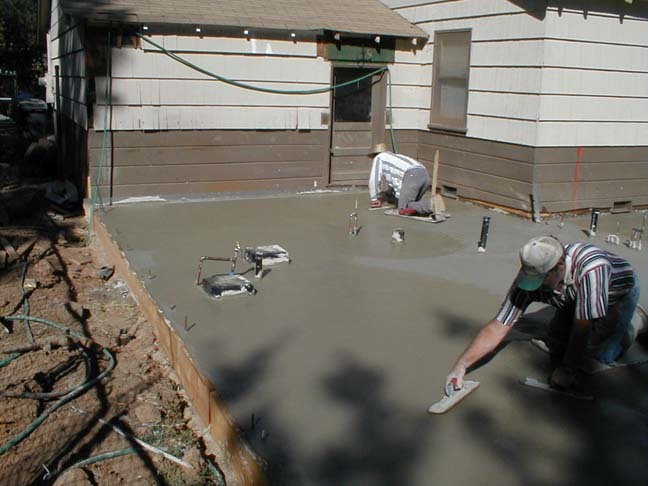 10/11/02 Well this is Sandra & my 5th wedding anniversary, so I took the day off working on the house. We spent the day at Lowes choosing doors and looking at tile and bathroom fixtures, how romantic! 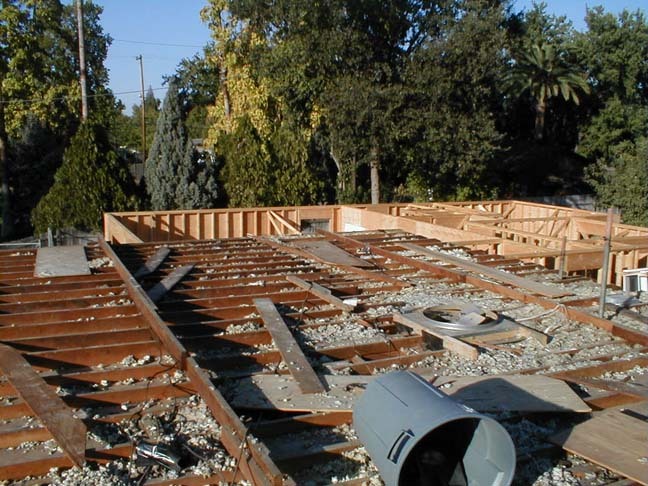 *** I opted not to put up pictures of the roof being stripped at the time due to the total lack of security the house and its contents were afforded by not having a roof. Now I can catch you all up! 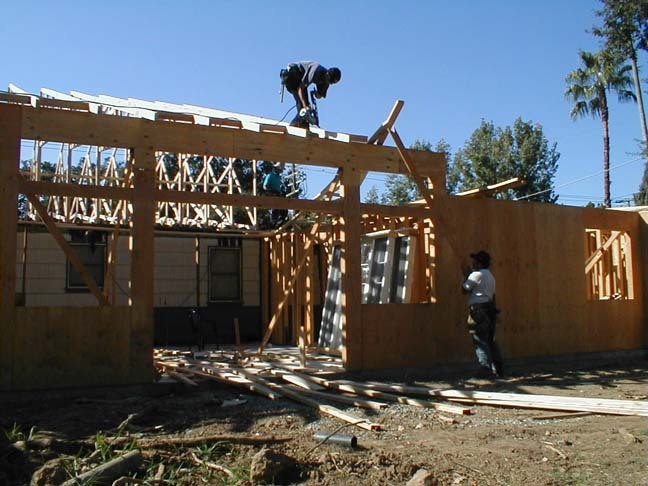 10/7/02 The guys showed up today to fix a few errors in the framing. (They forgot a window and the shop door and bedroom window were the wrong size.) 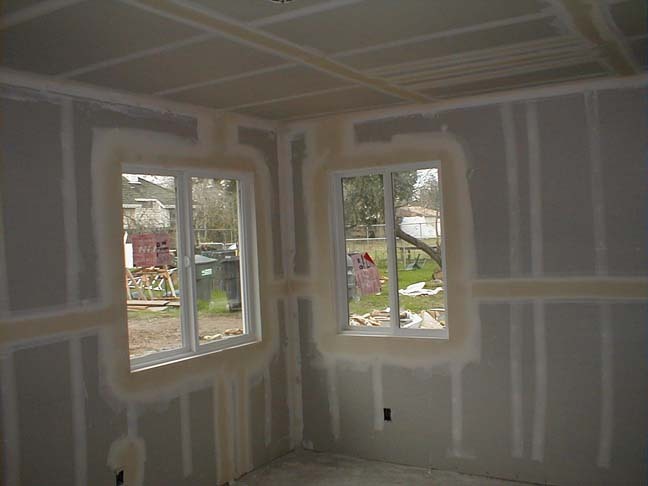 They corrected theproblems and then put on the shear wall (sheeting). That makes a huge difference to the look and feel of the house. 10/5-6/02 Based on the weather outlook (warm & sunny) I decided to start stripping the back half of the roof in order to remove the insulation. I decided to save the wood that I pulled off, so it took much longer. 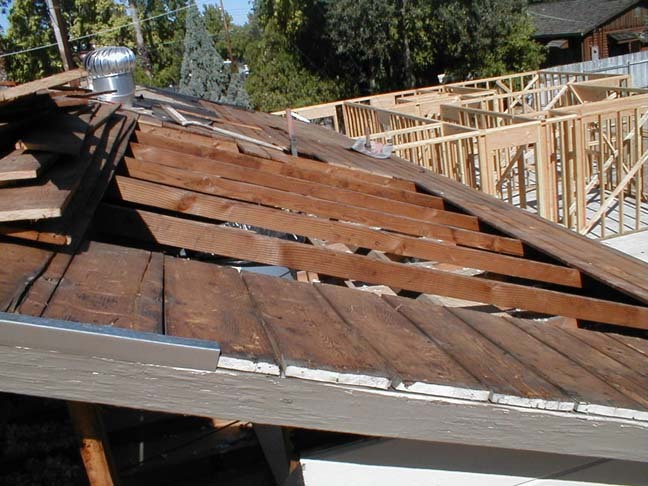 First I stripped off the shingles, then I pulled all the staples out that held the shingles and tar paper, exposing the plank sheeting. 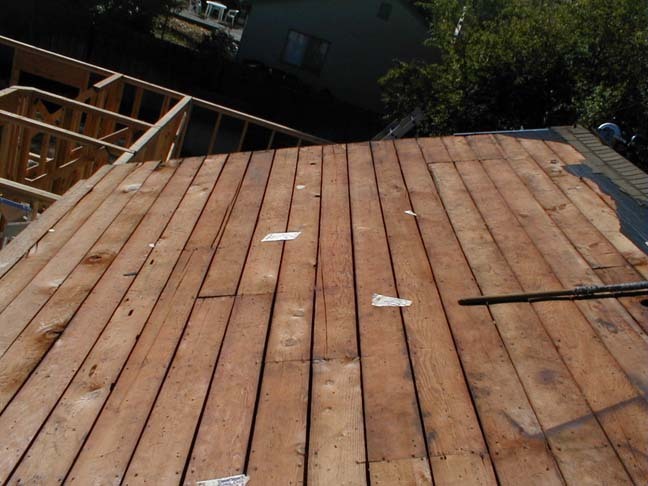 Next I pulled all the nails that held the sheeting and lifted the wood off. 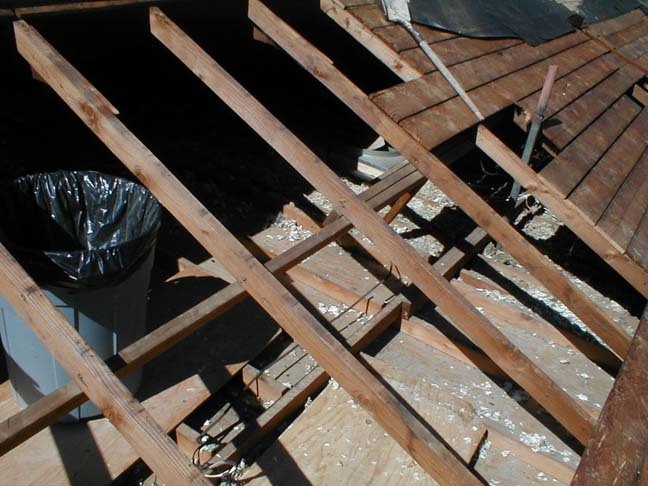 By Sunday, I ended up pulling about 1/2 of the plank sheeting to expose the attic and insulation. Next I pulled out the pink attic blanket and then started to remove the isulation. Overall it went well, but boy was it hot, and I had to wear long sleeves because of how nasty the insulation was! 9/28 - 10/4 Nothing really happened this week. The insulation in the attic was "Granulated Rock Wool", nasty stuff. If you are familiar with the stuff you buy at pet stores for pet rodents to build nests out of, this is essentially the same thing. It has probably been there close to 50 years and was packed down and covered with dust and rodent poop. 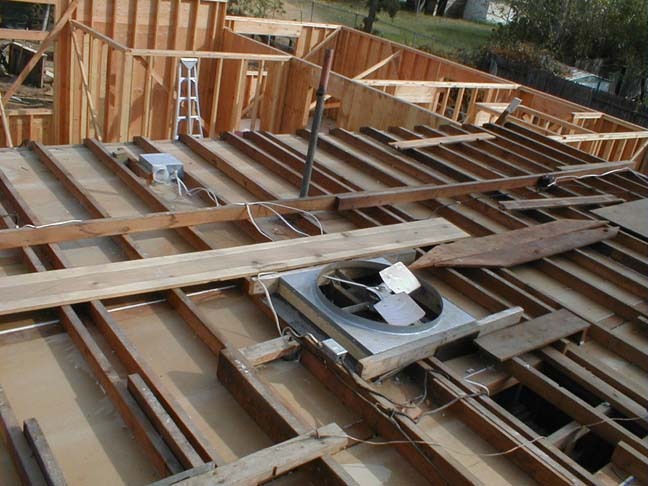 I crawled up into the attic and tried scoopoing out some of the insulation, it didn't go well. There just isn't enough room up there for me to scoop insulation and put it in a bag. Bummer! 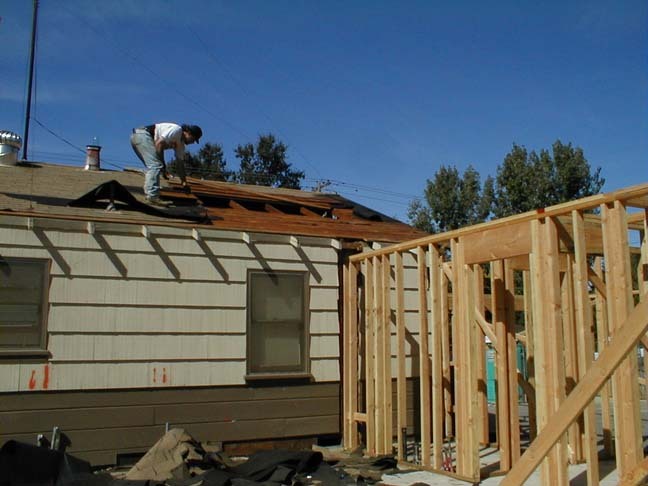 9/28/02 The crew showed up around 8 a.m. and finished it all before noon. The most impressive was when they stood the wall of the family room. Then if felt 'real'. Sandra actually is happy about the house. The shop walls went easy as 1, 2, 3, 4! 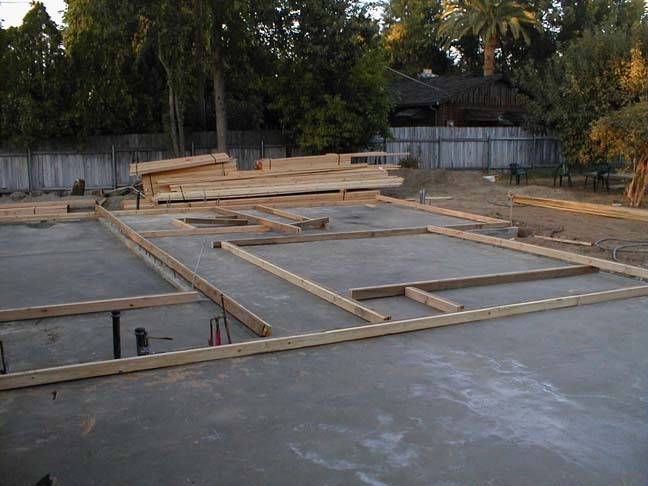 Here is the basic layout of the addition. 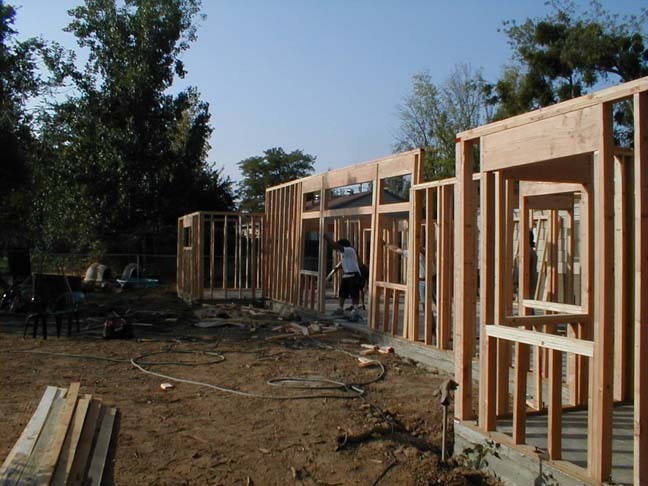 9/27/02 The framers are supposed to be here today and I can't wait to get home to see what was accomplished! Well here is an update as of 2:30 p.m. 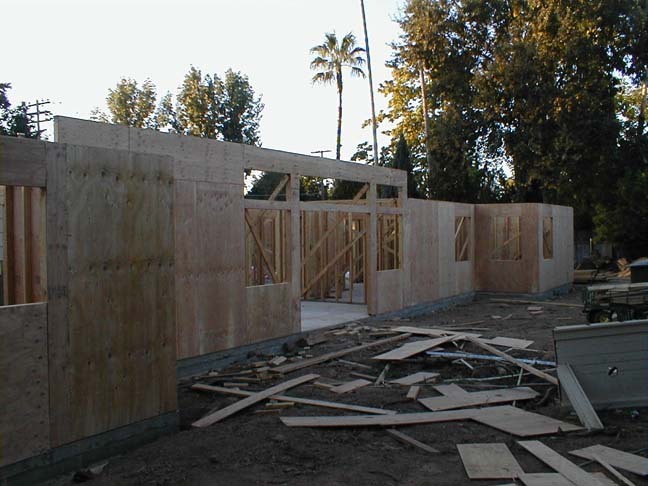 They almost finished the framing today and will return tomorrow to finish up. 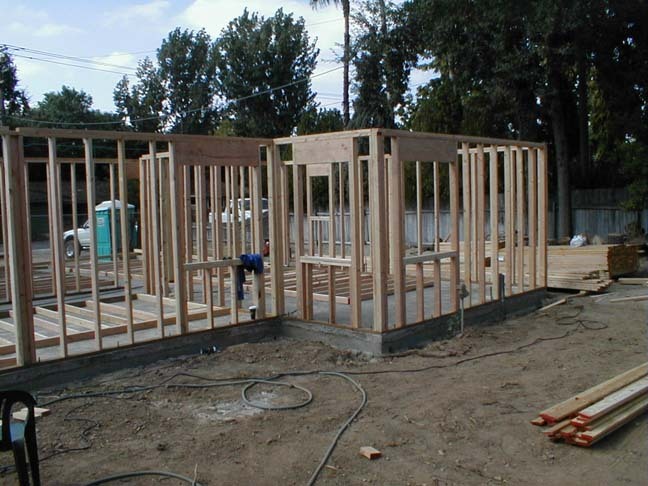 9/26/02 Well I didn't think the framers were coming by today, but more of the layout was done when we got home, I'm certainly not complaining! Sandra likes it! 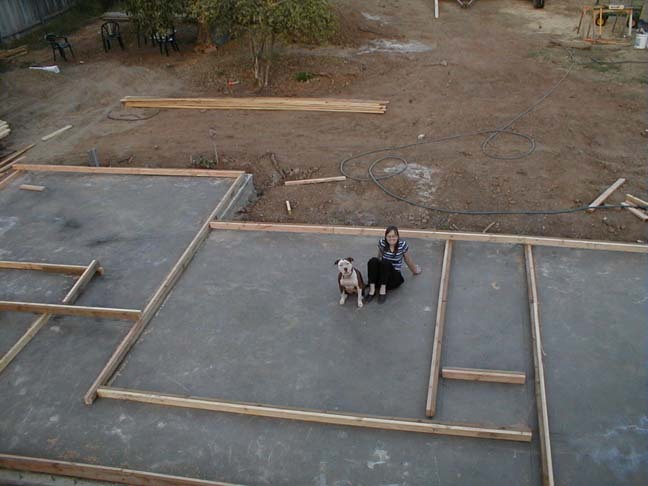 Honey was certainly glad the concrete was hard enough for her to get out. 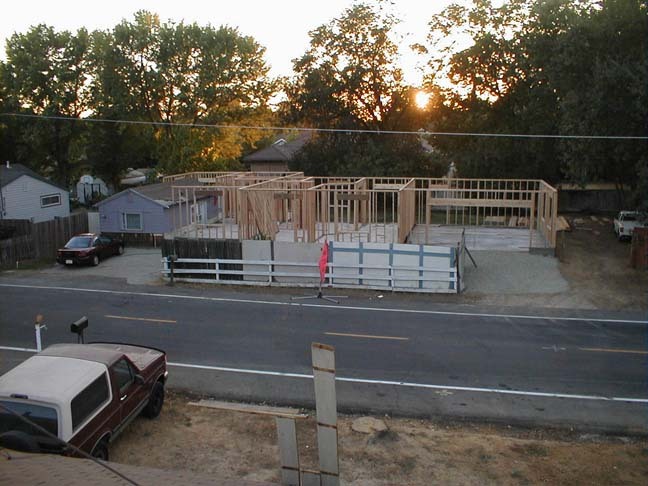 The house that is under construction across the street had the framers arrive today, they came close to finishing the downstairs in one day! The race is on! I think w'ell catch up because we are single-story. The framers showed up and started the layout, which is good. I kept working on stripping the walls where necessary. 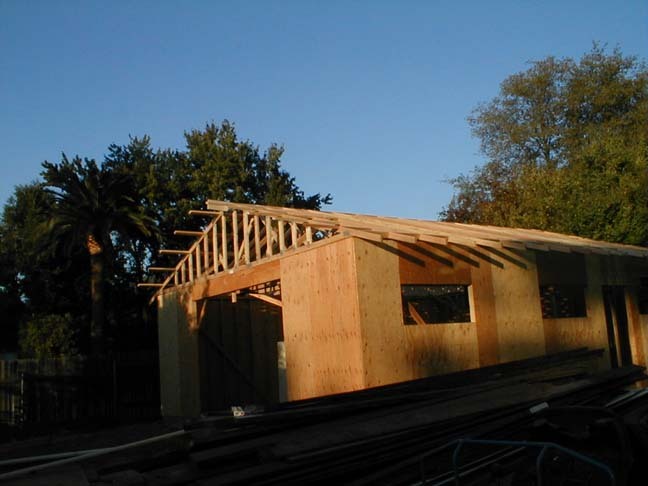 Unfortunately, the trusses won't be delivered until 10/15/02, so we got bumped by a week. There is still plenty to do at this point, but we are anticipating almost a week of downtime, I guess that will be the time to catch up on everything else! 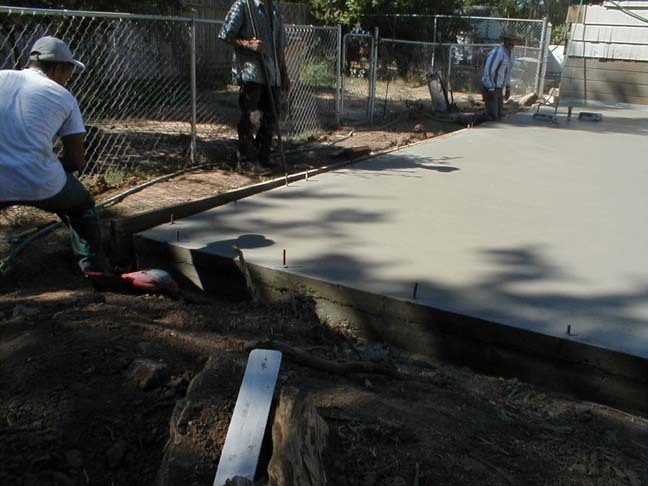 9/24/02 This was basically a repeat of yesterday pouring the slab. 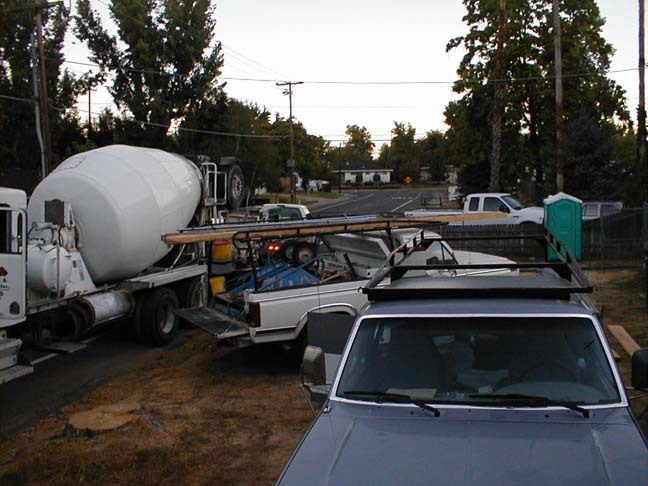 The shop went first, however they were a little short on concrete, so they had to wait for the next truck. 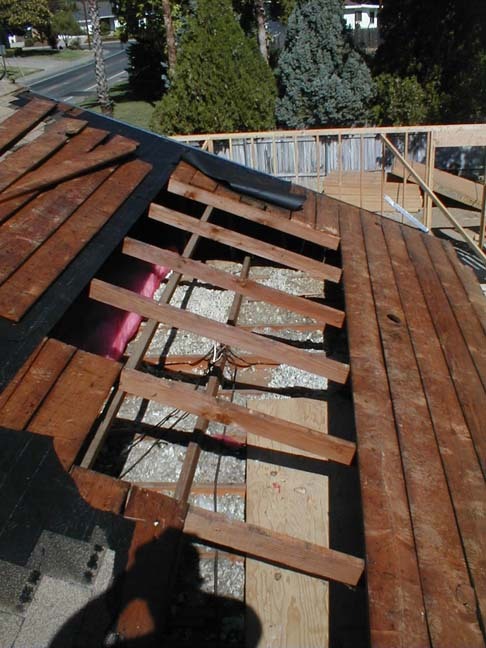 As they 'took a break' waiting for the next truck, I started stripping the roofing and siding in the areas the framers would be working first. 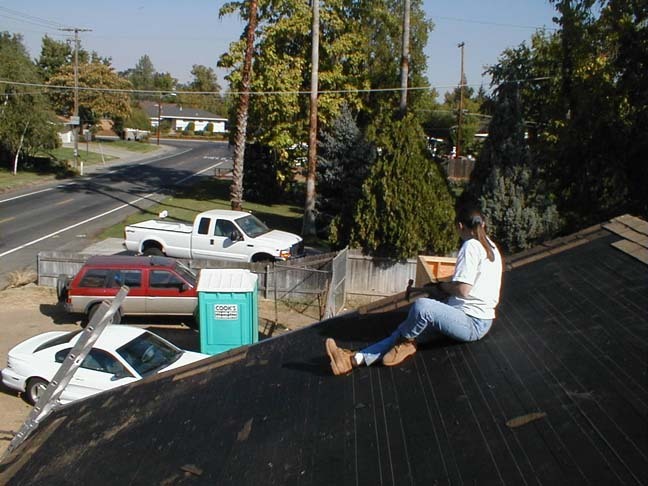 It was a definite role reversal as I schlepped on the roof, and the concrete guys sat in the shade and watched me sweat! 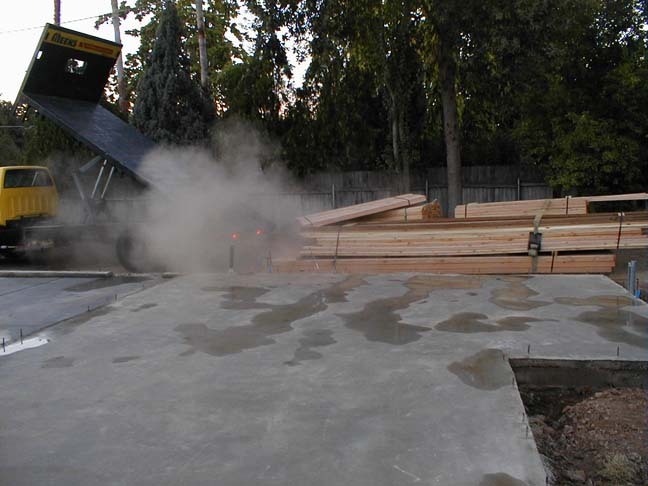 The concrete used for the slabs is reinforced with fiberglass fibers, which on the shop and garage were plainly visible, it looked like a angora bunny had been thrown in the mix, I'll see if I can get pictures of it. The pours went well and they were cleaned up and out of there around 2 p.m.
We are now all set for the framers who should begin tomorrow. Finally at the end of the last truck, they could tailgate the concrete. 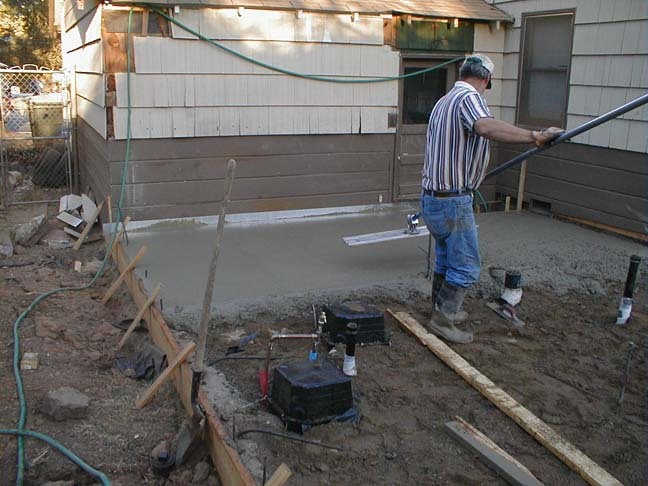 As they continued working the slab, we noticed Bob always worked the area in the shade. At 11 a.m. they started stripping the forms, eventually the shade ran out and Bob was stuck in the sun. 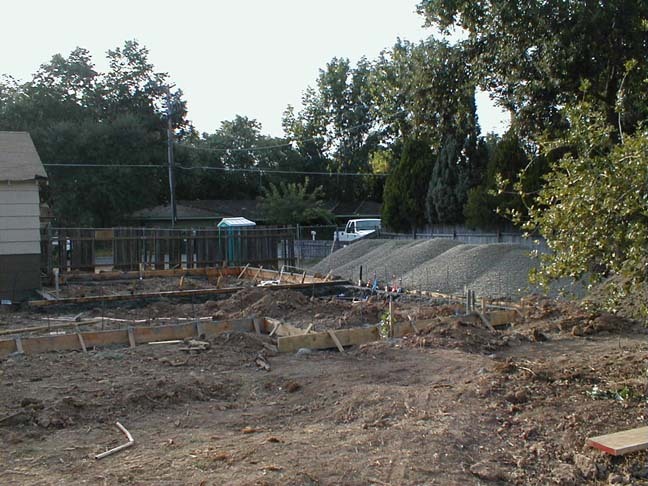 9/18-21/02 The guys came back and distributed the gravel and sand into the footings in preparation for the slab. I also finished running the conduit from the box we are putting in the middle of the family room to the walls so I can pull cable through them. I also got the back 'porch' removed exposing the original paint job, ooh pretty! 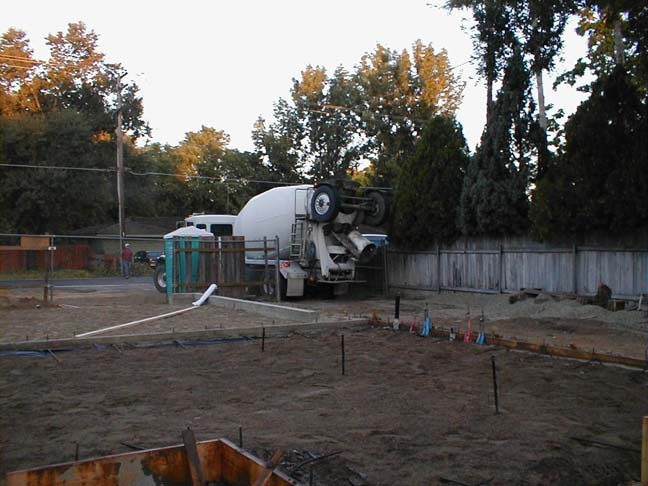 9/17/02 The footings were scheduled to be poured today, the concrete guys and pumper were at the house at 6:30 a.m. or so. 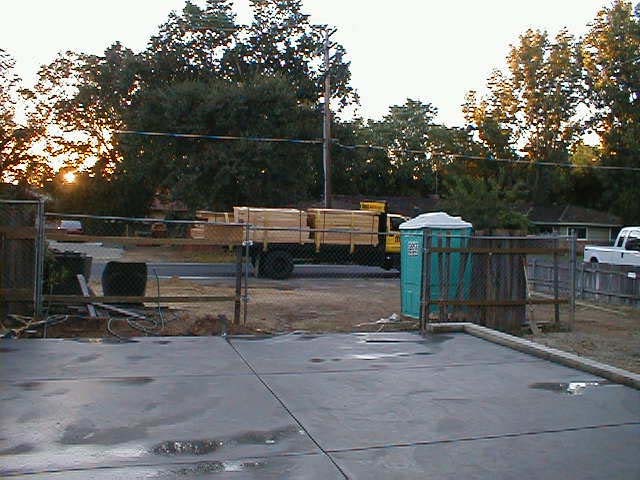 The concrete truck showed up by 7 a.m. Here is what our front yard looked like at that point. I watched for a few minutes as they got started with the pumper, then as they continued working the hose around and finally as they set the bolts and re-bar. Then it was off to work, we need to pay for this place you know! I got home from work and was looking at the ugly, but functional footings when I heard a large truck approaching, then I saw this! 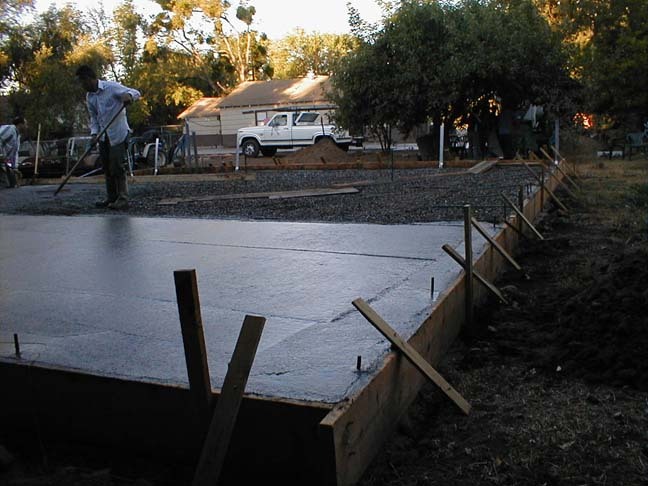 Unfortunately the slab pour got bumped to Monday. 9/16/02 The first inspection went well. 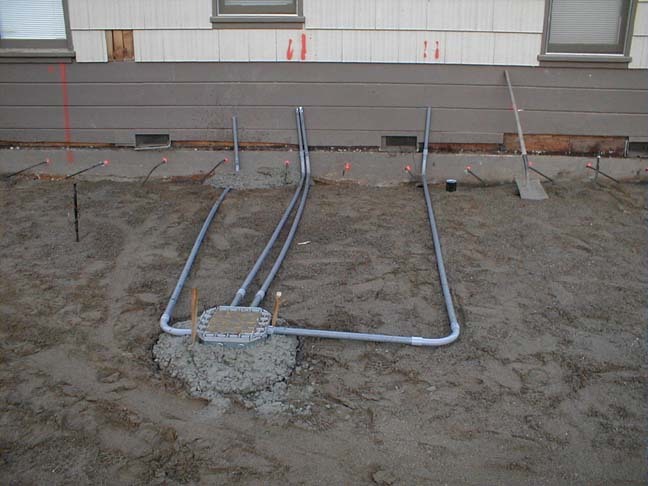 Afterwards some conduit was put in place for the electical and data box in the family room floor. 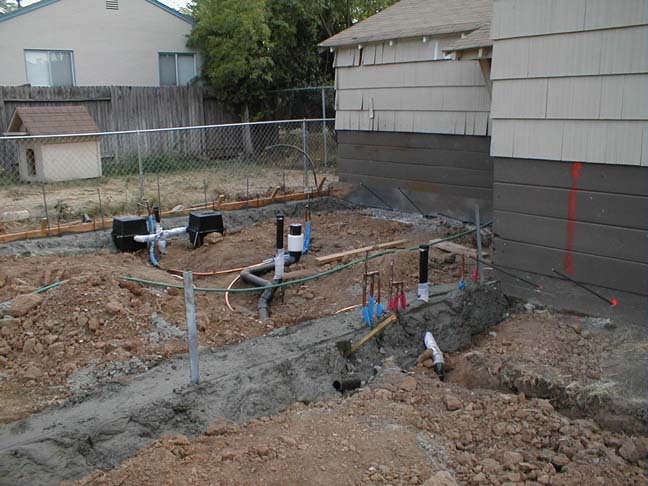 The footings should be poured on Tuesday and the slab poured Friday, things are really picking up! 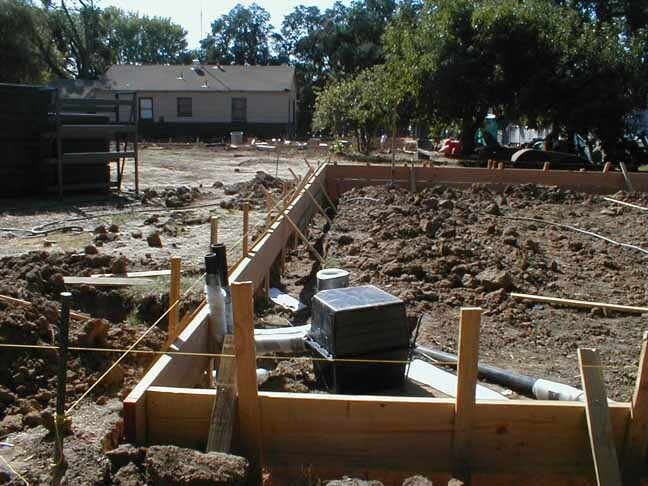 9/13/02 The plumbers finished up the drain work, they will lay the copper on Saturday. 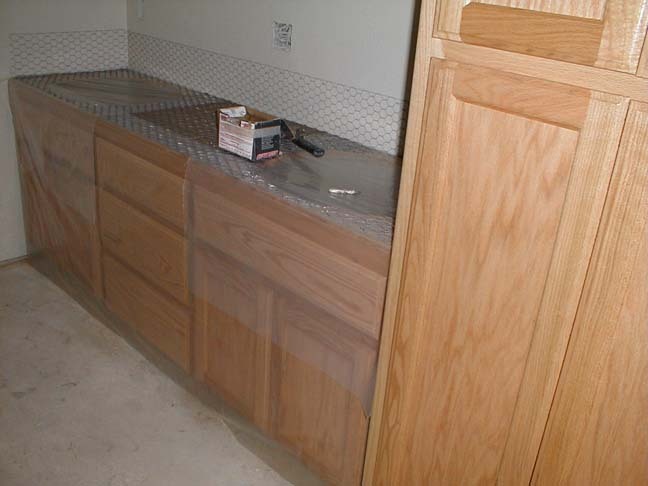 9/12/02 The plumbers busted their hump and almost finished the plumbing. The first inspection should be Monday! We are finally a 2 bathroom house! (The port-o-potty was delivered) Sandra isn't too happy that it sits in the front yard! 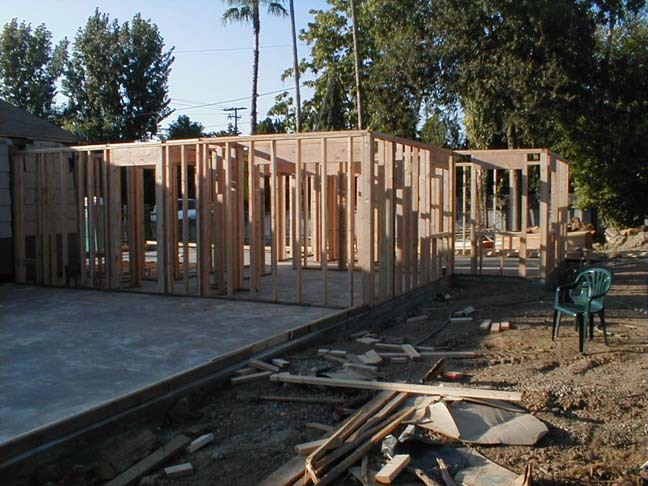 9/10/02 The work on the forms continued, the forms were put in place for the shop. The plumbers dropped off some pipe. 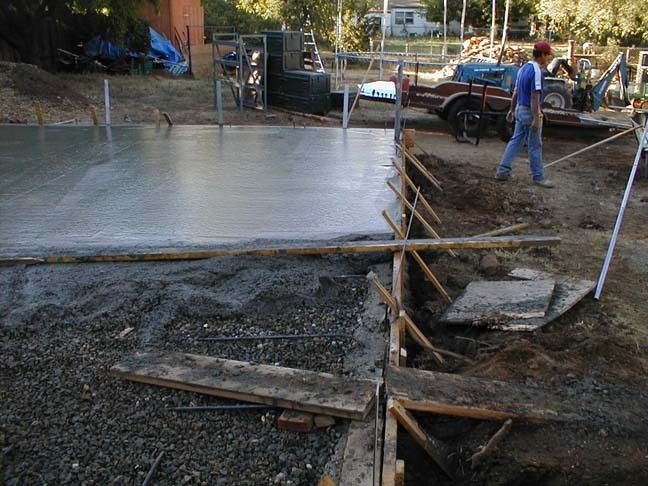 9/9/02 The concrete guys started setting the forms for the addition. 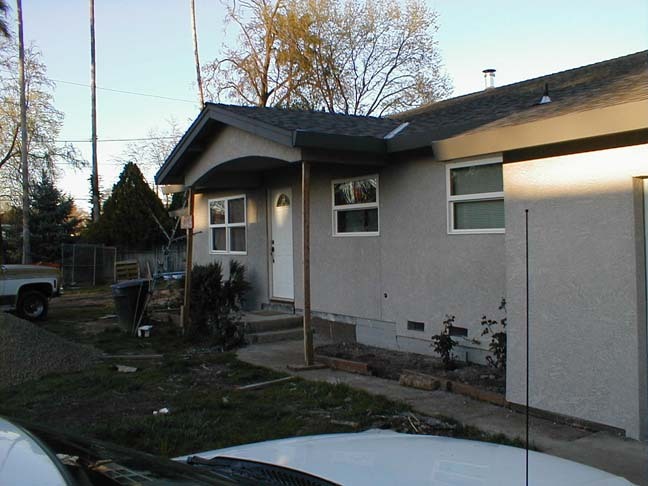 We originally purchased this home with the goal of adding on to make it a reasonable size. 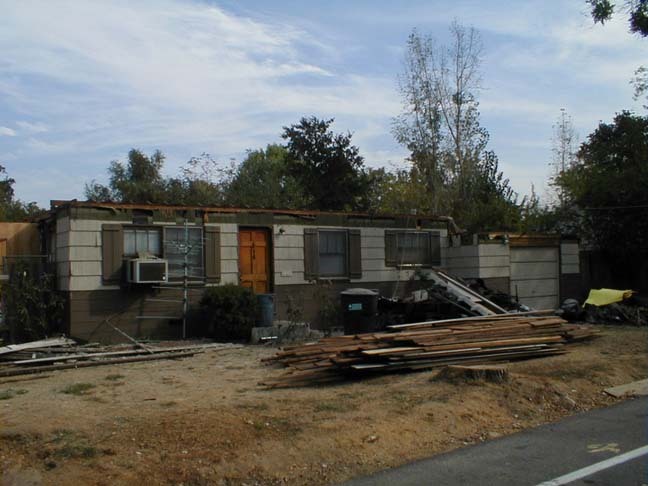 The small house (850 sq ft) was built in 1950 and sits on a half acre, the interior is almost all original. Before we moved in, we pulled the carpet up in the back half of the house (the bedrooms and hallway) and had the original hardwood (red oak) floors refinished. We were thrilled with the results. 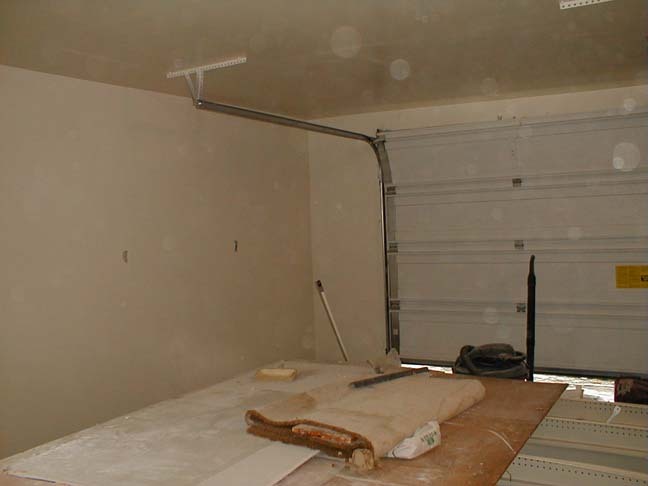 We also semi-finished the garage, we insulated it and ran power through out before we installed sheetrock. We spent the next two years living in the house and coming up with floorplans that we thought would fit our needs. After agreeing on a design, we contacted a draftperson to draw up the plans 'for real'. I got a referral from a co-worker and ended up hiring Rick to draw the plans up. 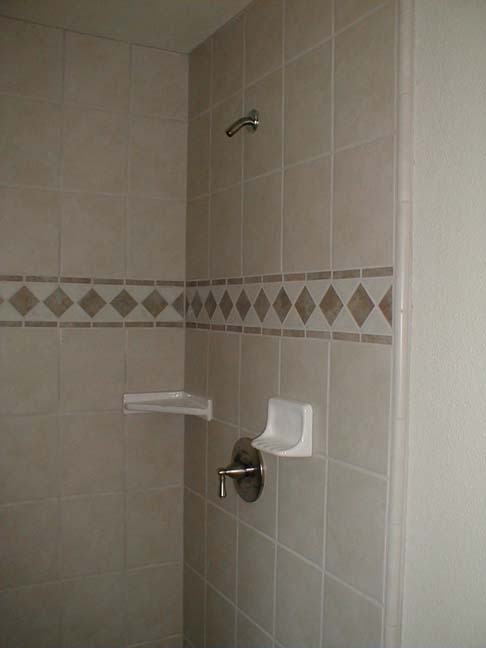 Rick had a few ideas that were excellent and added to the asthetics of the house. 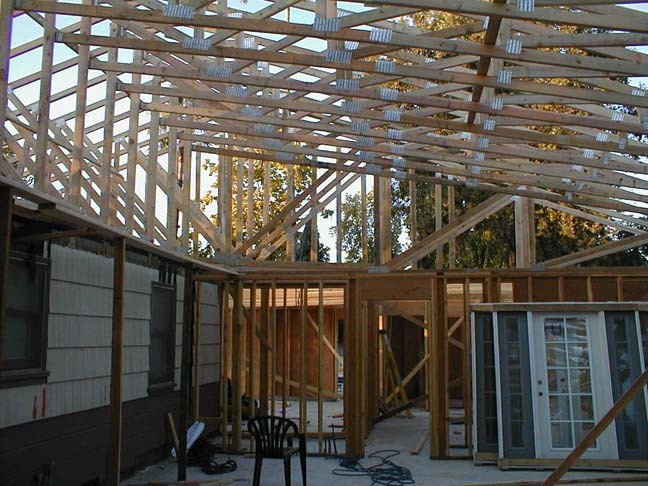 Our plan was to do the project as an owner-builder, meaning I would work as the General Contractor and simply hire subs to perform the actual work. This is a fairly large project and the stress would be high for us, but we were prepared for it. The reason we were working it like that was really simple, finances. It is said that you can save 20-25% off the top by simply working as the general yourself. 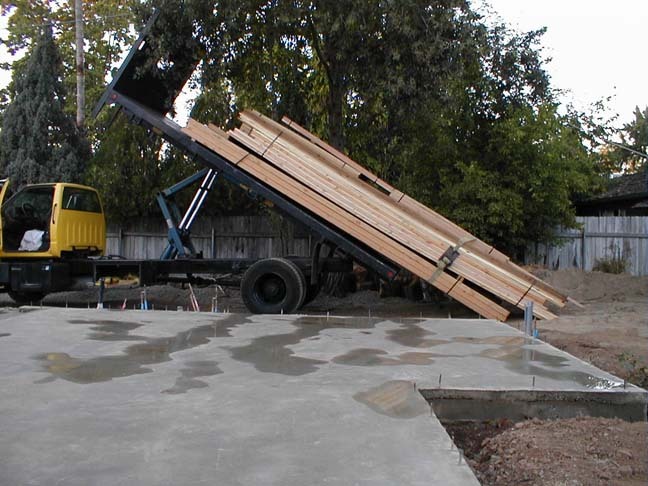 Our next door neighbor told us that his brother-in-law (Dave) was a general contractor and we should get a bid from him, the next thing we know, we got a bid from Dave that was close enough to our planned budget to convince us to hire someone to run the entire show. 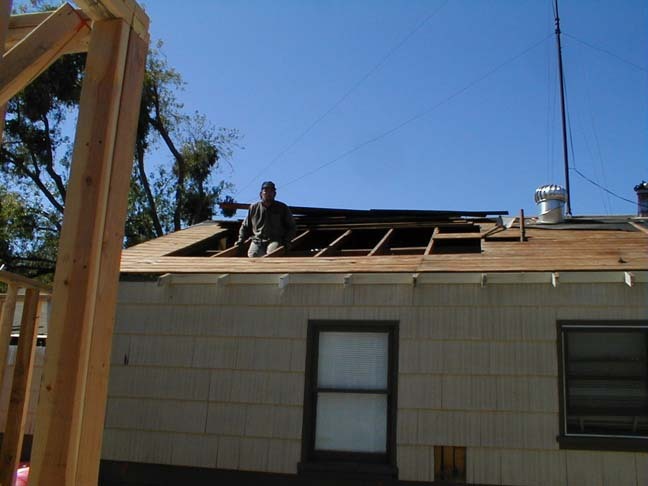 I had already gone through the process of having the plans drawn up and had also already gotten the permits, so Dave took over from there. We had a lot of work to do to prepare for the actual construction to begin. There were multiple trees to be removed and a bunch of concrete throughout the yard that needed to be moved. 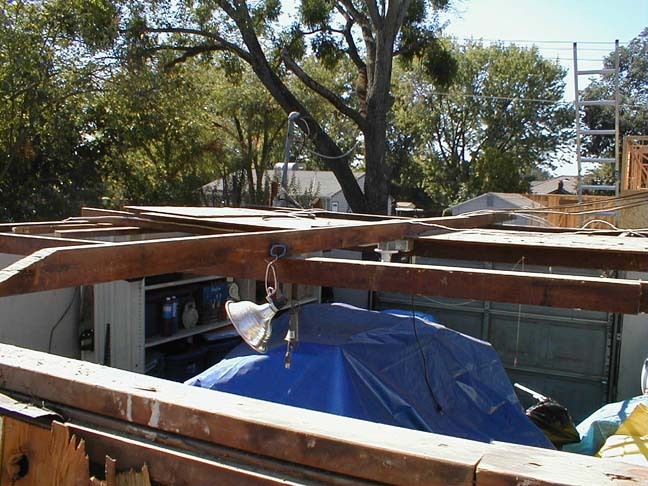 We spent about 2-3 months taking care of these things as we were going though the permit and financing process. We finished our part the night before Dave started work. 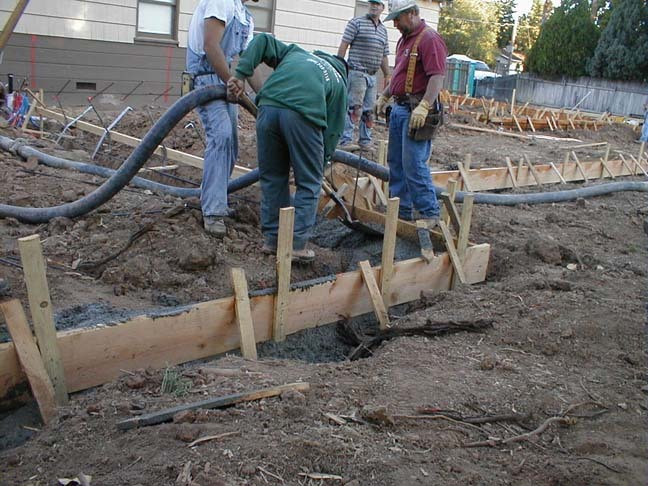 Trenching for the footings began on August 28, 2002. 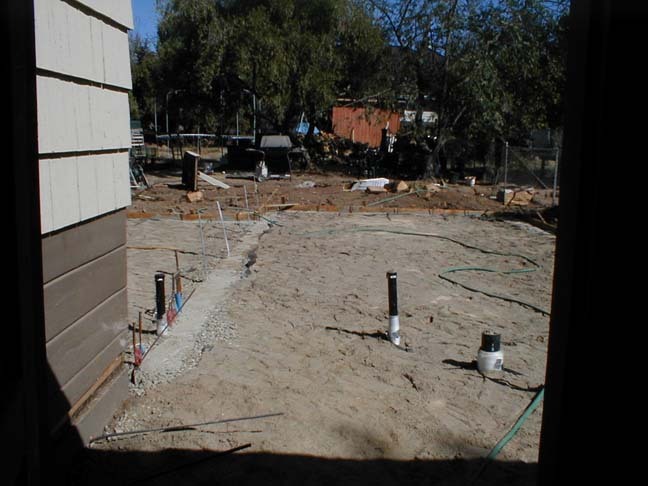 The concrete guys weren't available until the week of September 9, so Dave could take his time in doing the trenching. New Garage This is a shot from the front corner of the new garage. ShopForward From the back of the shop bathroom looking forward.